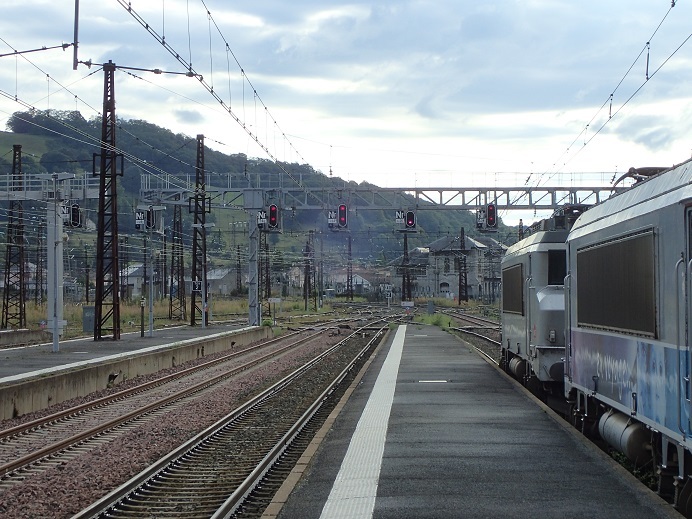 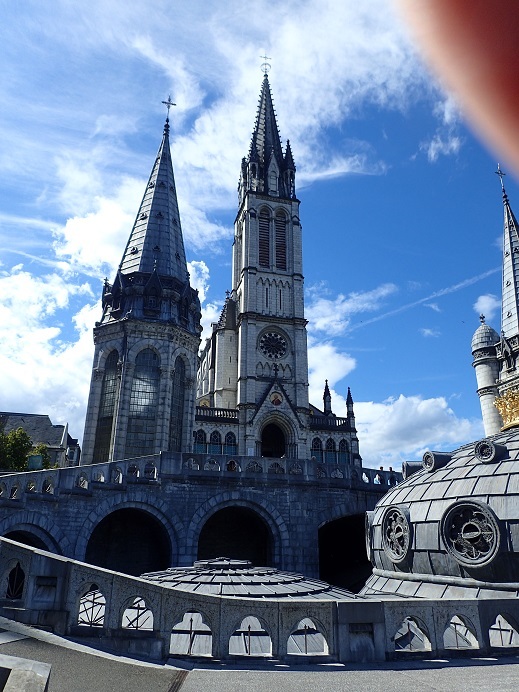 Dave had opted to take the train to France & was thus already in Lourdes as the rest of the group waited at Stanstead and bought breakfast from Weatherspoons. 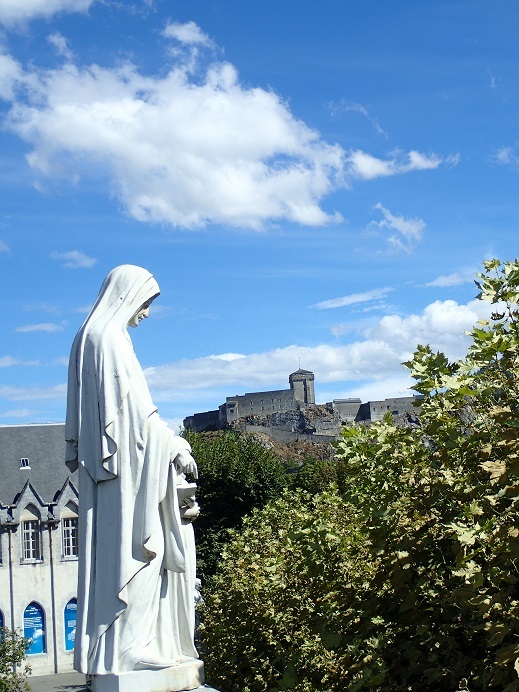 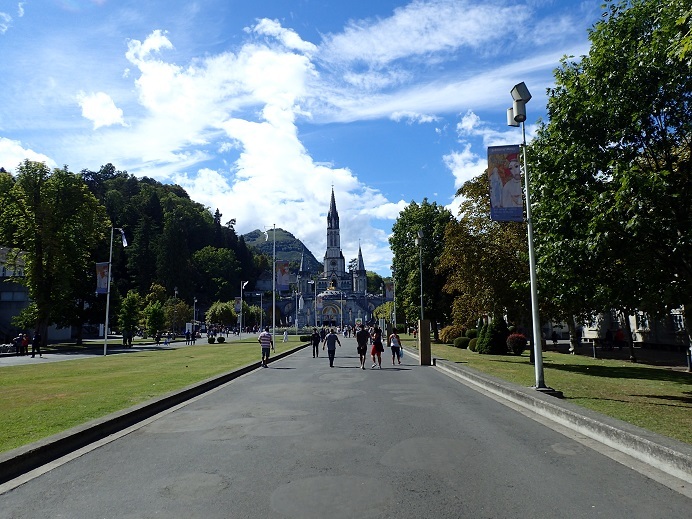 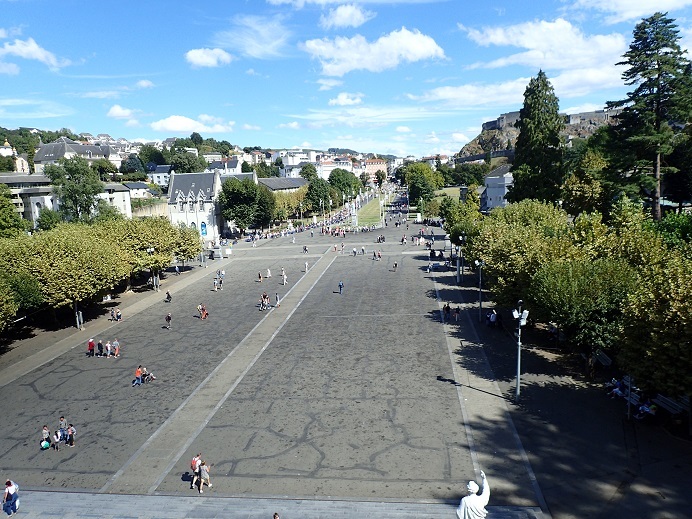 A short flight & we were in Lourdes. 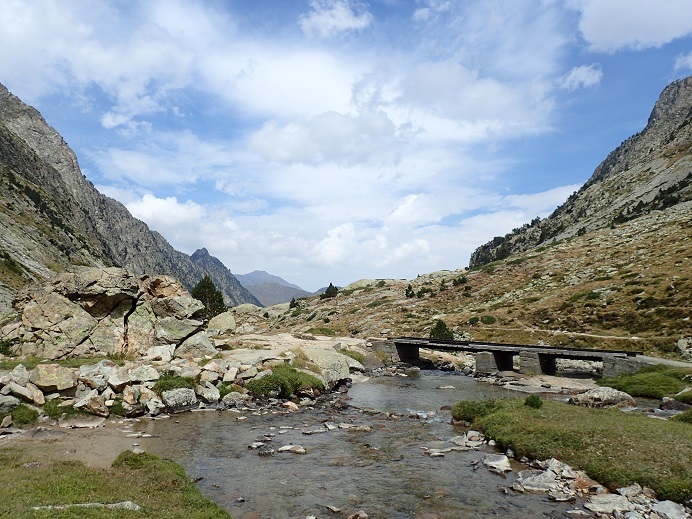 After a minor bit of confusion over taxis we were heading for Pont D’Espagne & the start of the week proper. 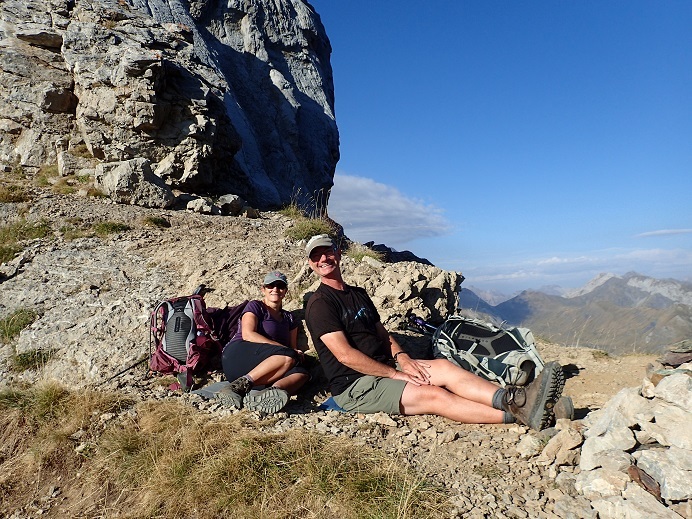 It was after lunch & we had about 3hrs to walk the 6km to the first hut if we wanted dinner. 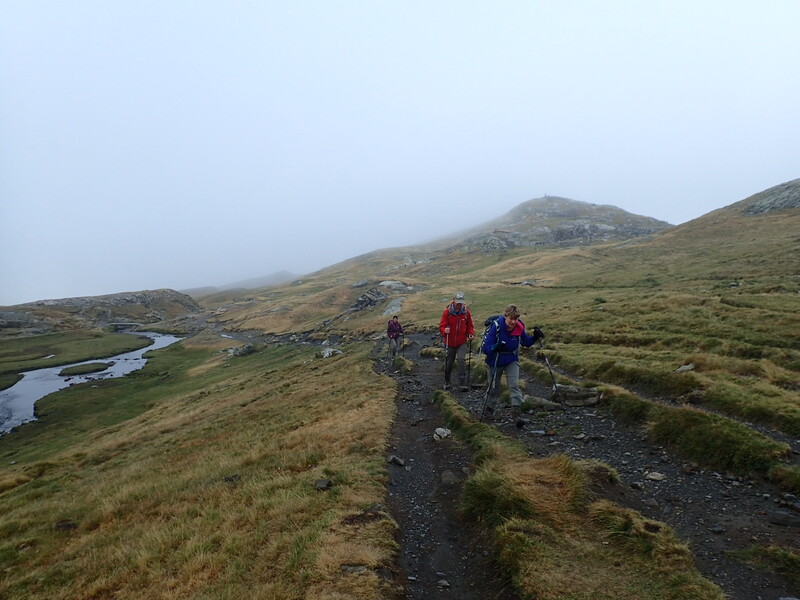 It was cold & wet, so a fast pace wasn’t too much of a hardship. 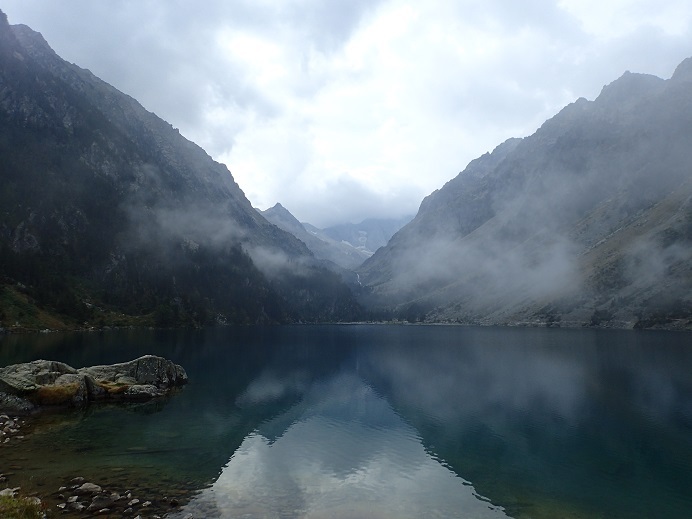 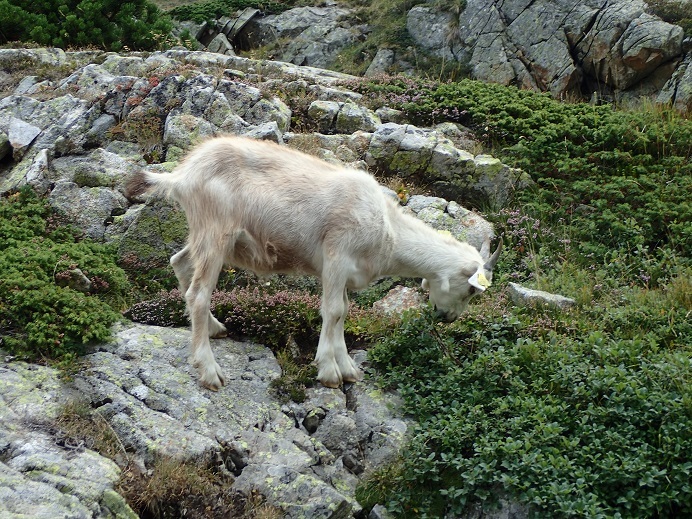 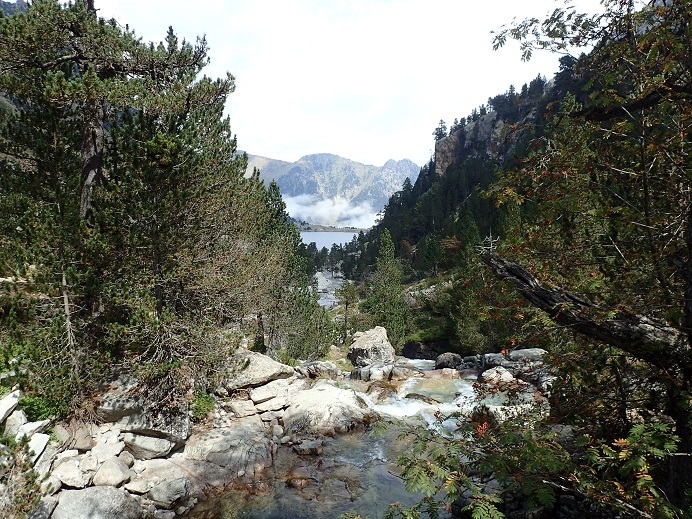 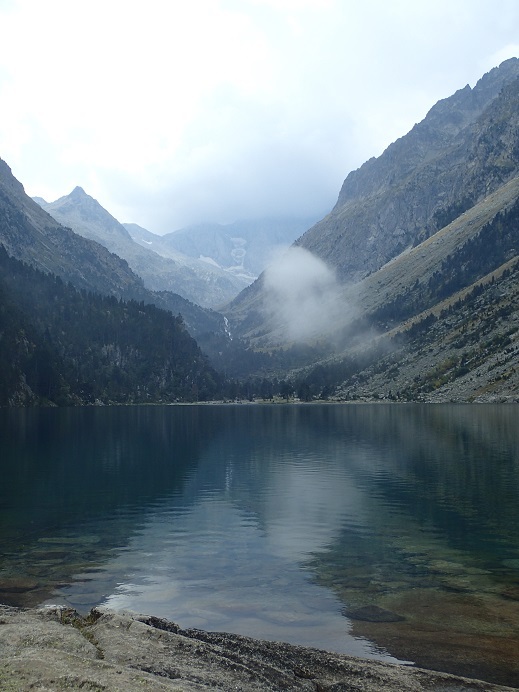 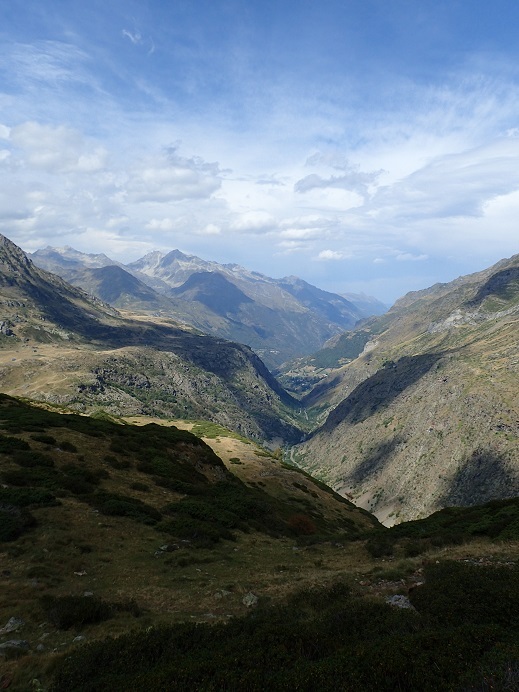 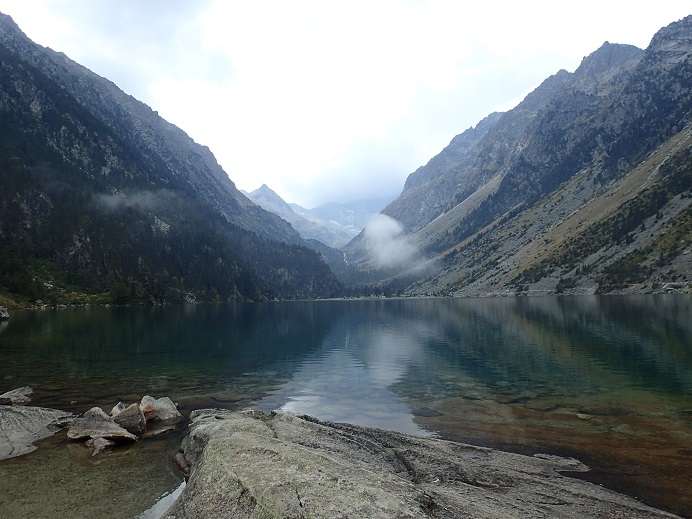 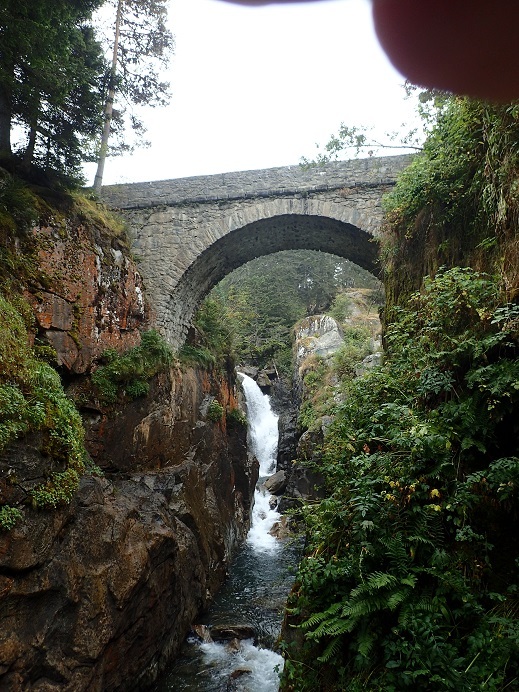 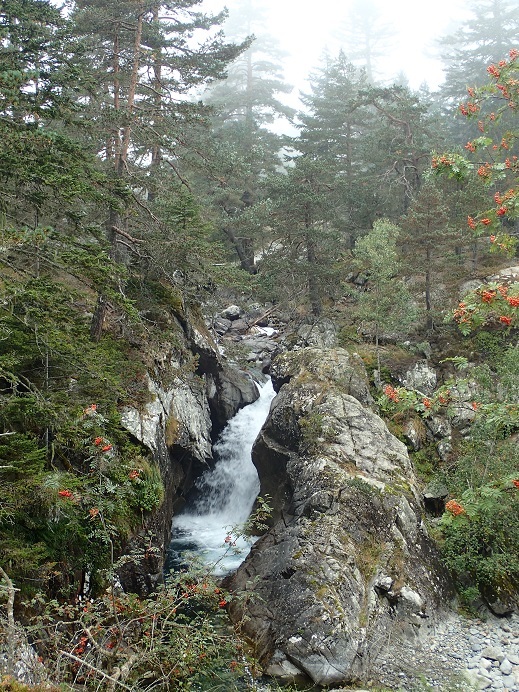 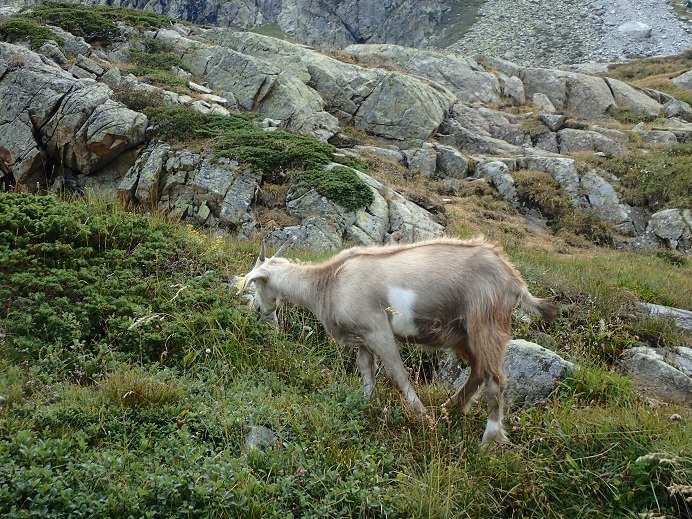 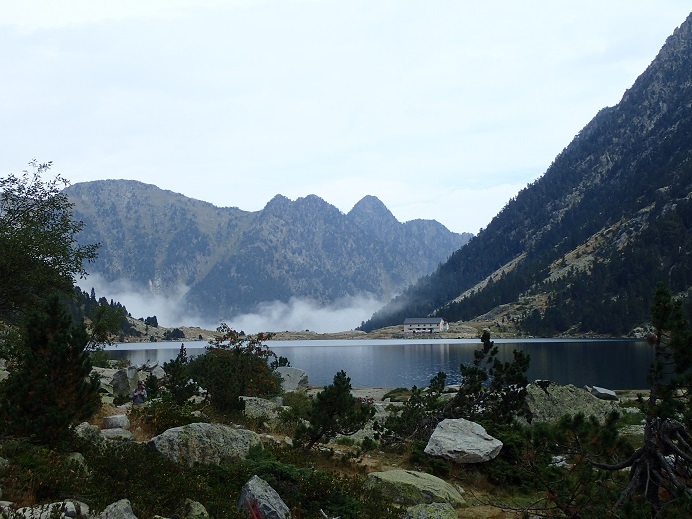 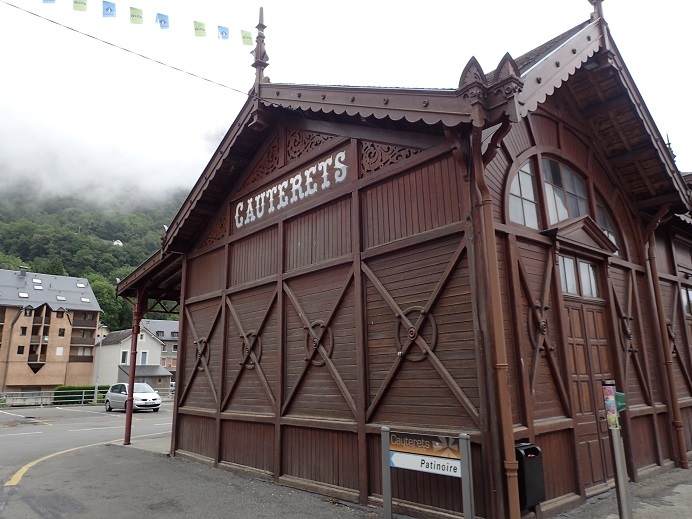 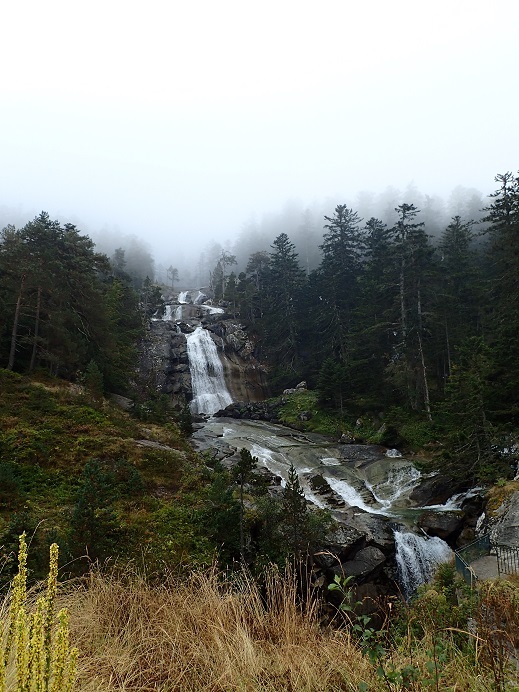 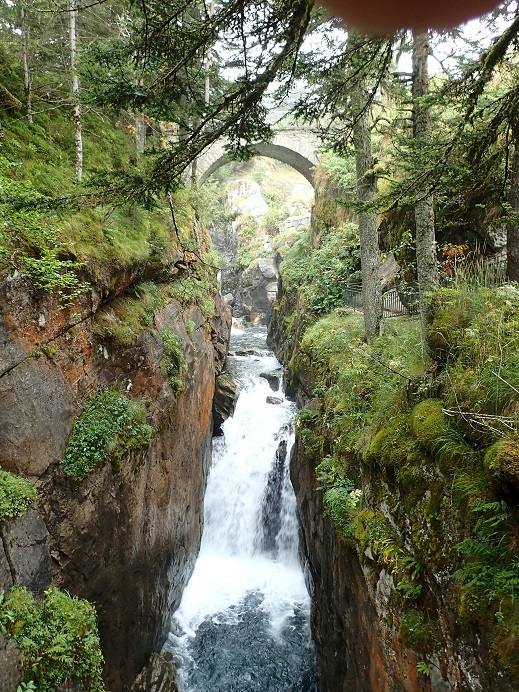 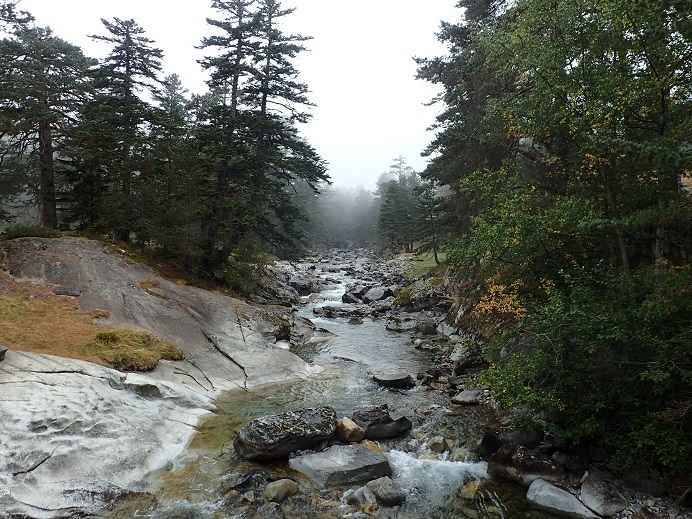 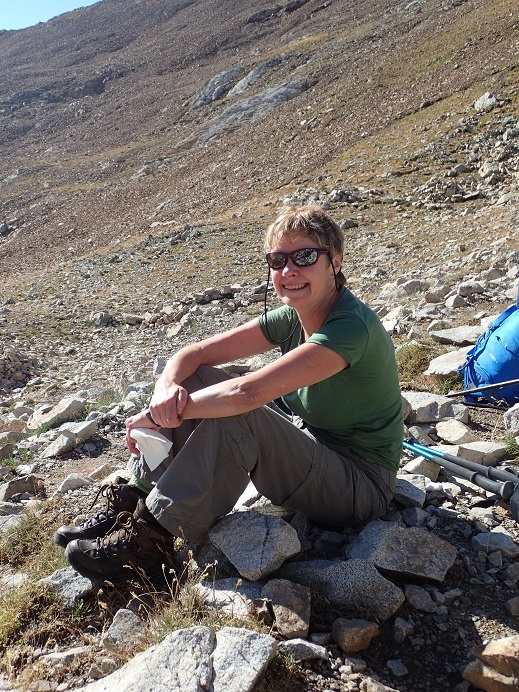 Instead of stopping at the small hotel & bar at the Lac de Gaube we carried on up the trail. 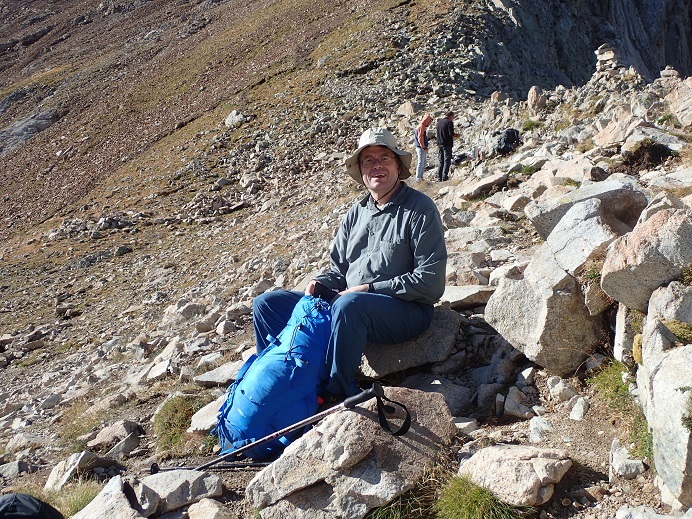 A walker coming down from the refuge told us that Dave was in good spirits & waiting for us with the beers. 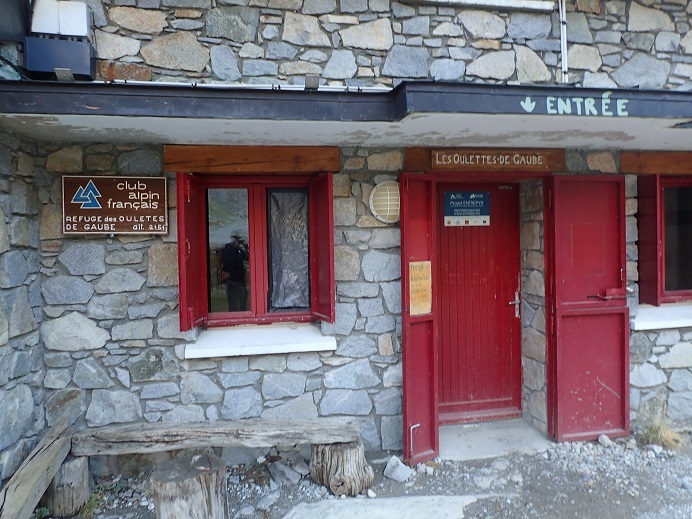 We duly arrived at the hut, one after another, booked in, chucked our stuff on our bunks & waited for dinner. 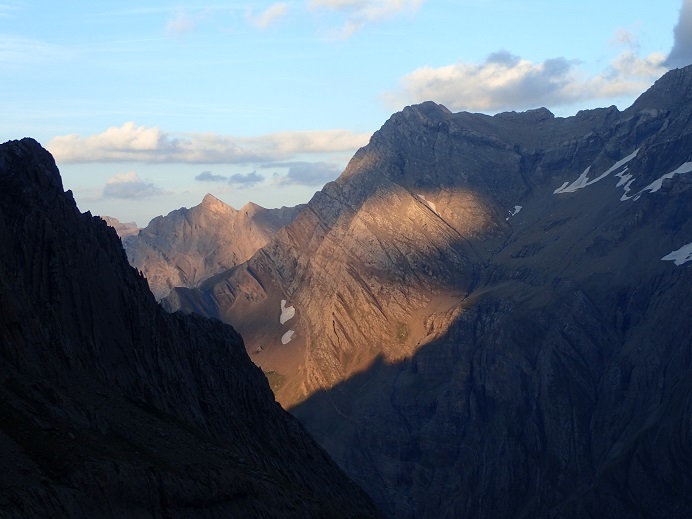 Today was a short day with the option of a peak or two. 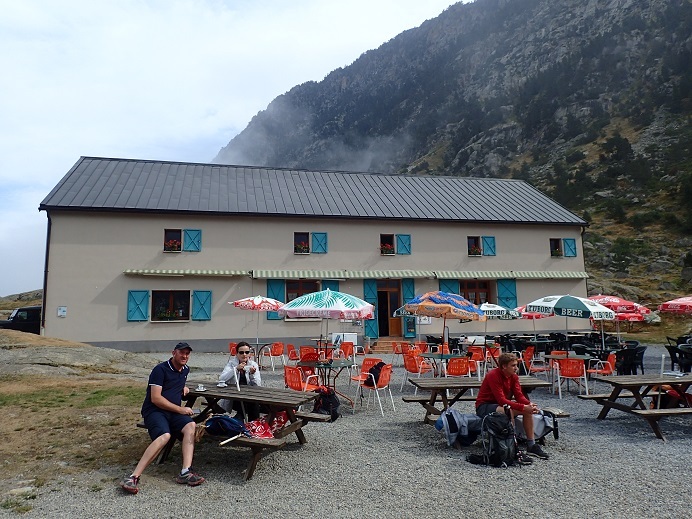 After breakfast we left the hut & headed off up to climb to the Horquette d’Ossoue (2734m). 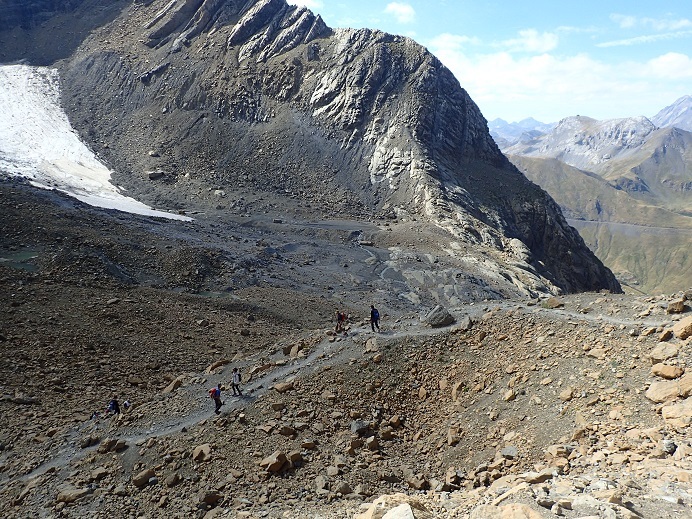 This was an easy climb & after an hour or so the group was at the col. To the right was the easy 3000m peak of the Petite Vignemale (3031m) which most of the group opted to climb. 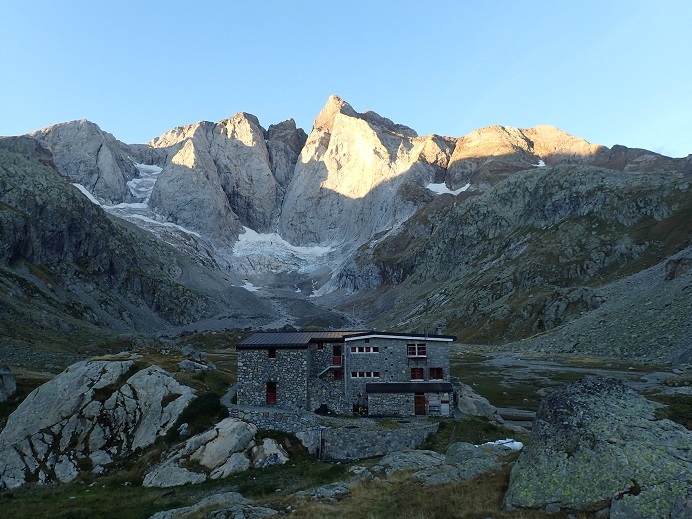 The Baysellance hut where we were staying the night was only 1km from the col, so there was no rush. 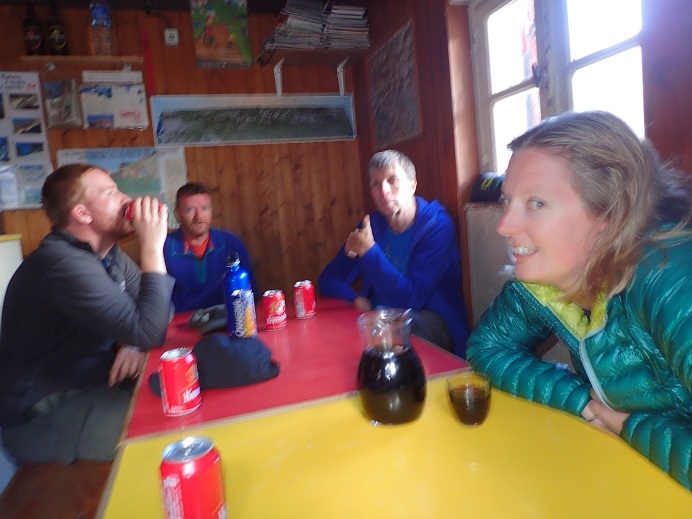 Dave, Steve & the two Dan’s headed down to the hut for beer & lunch, & were joined by Andy & Sarah. 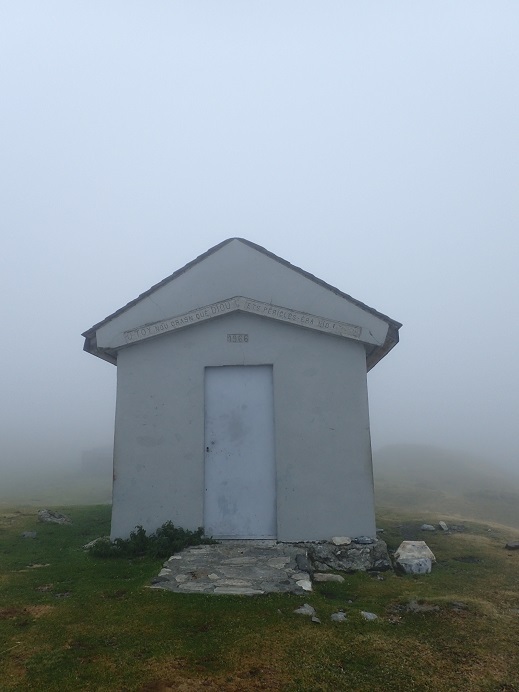 The main attraction at the hut ( apart from the view ) is the Vignemale proper, so after lunch those that were down from its smaller brother decided to go & ‘have a look’ at the route. 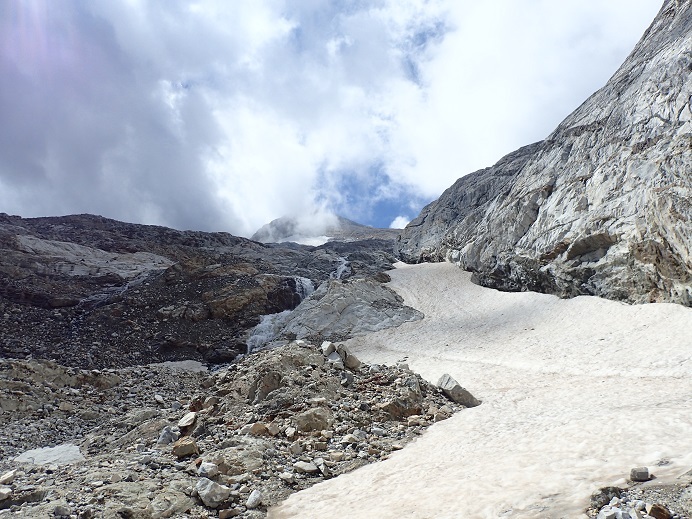 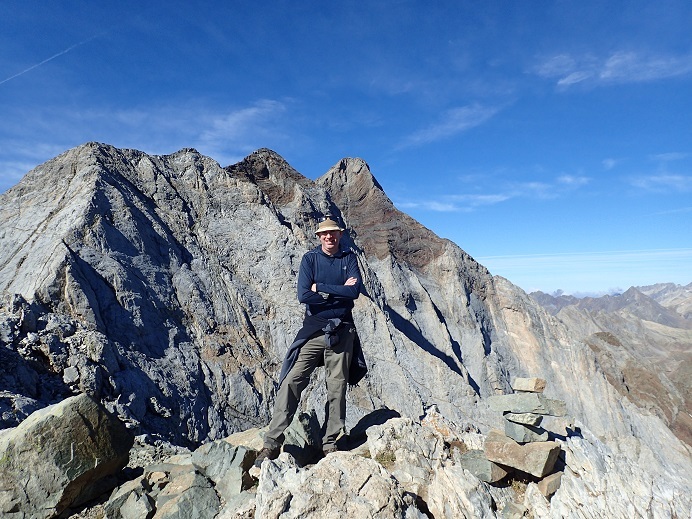 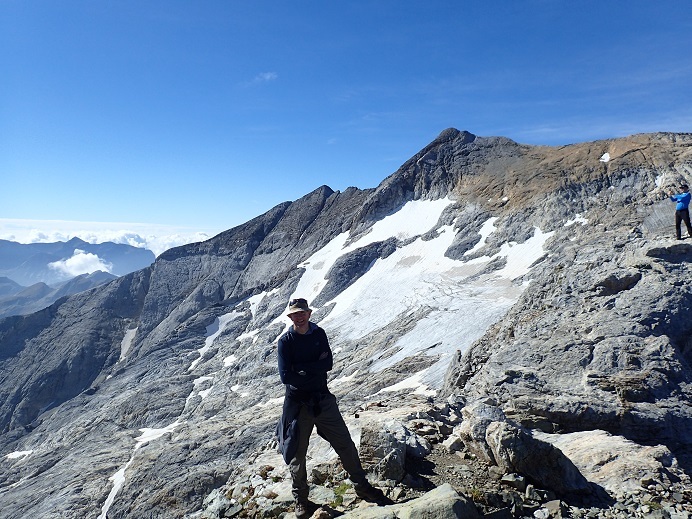 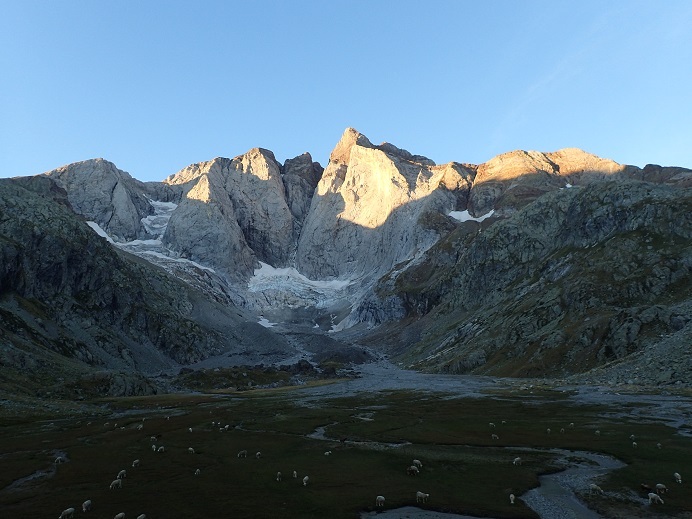 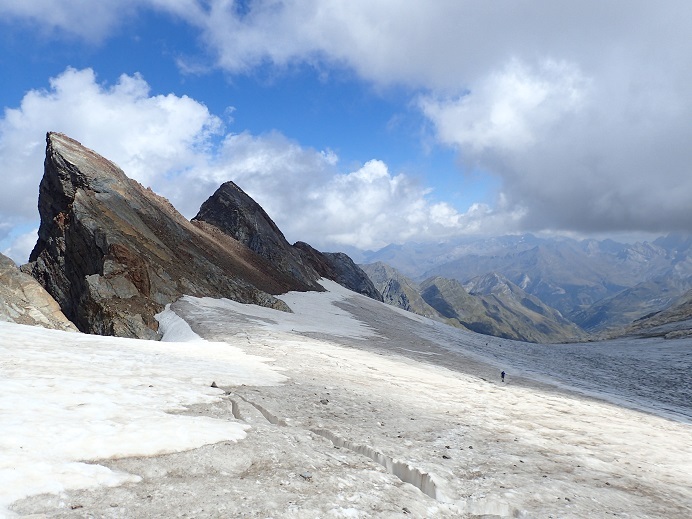 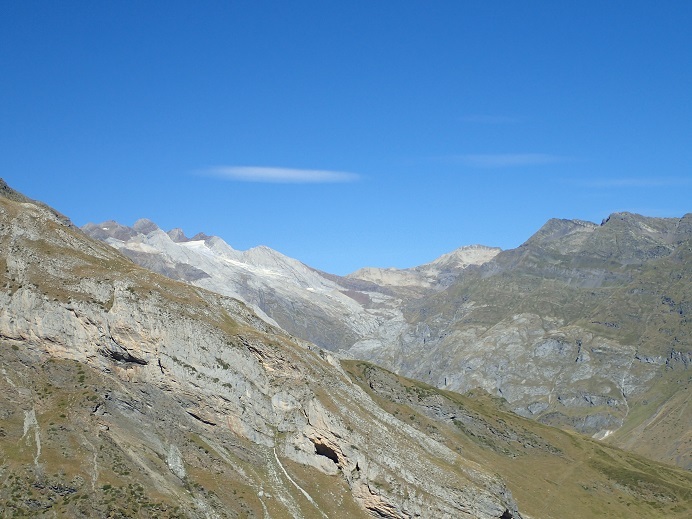 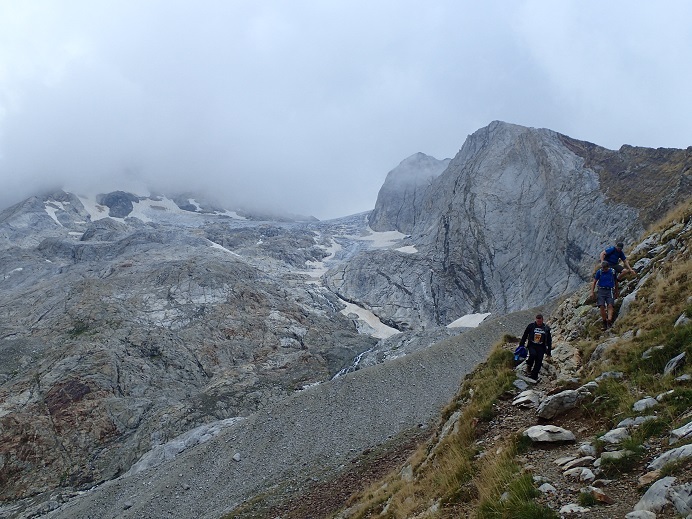 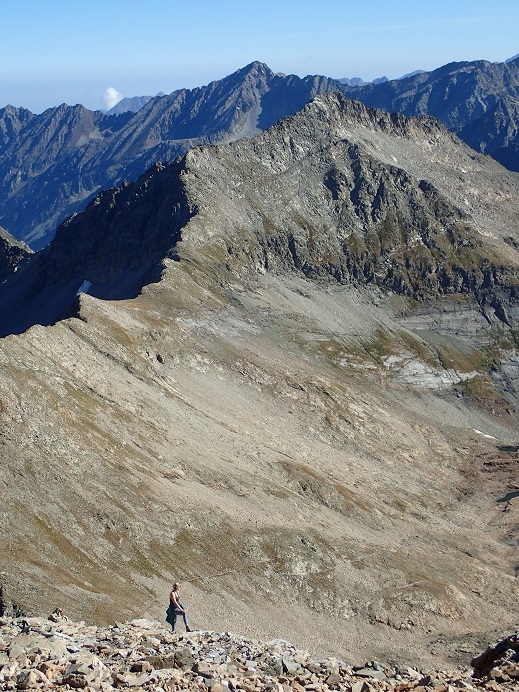 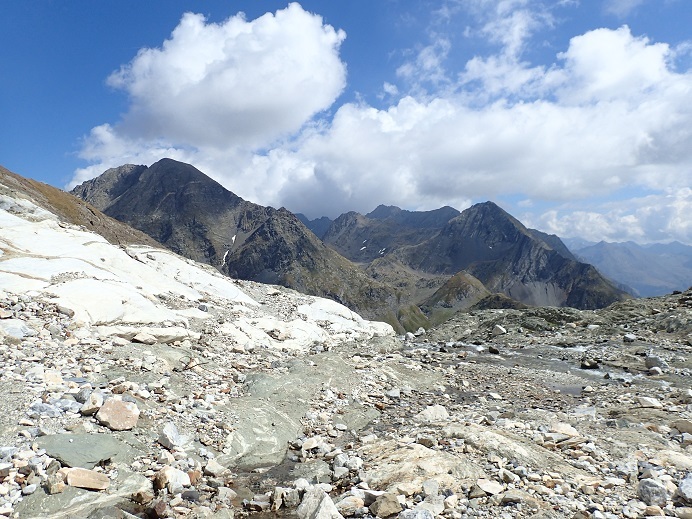 The Vignemale (3298m) ascent involves a small glacial crossing & a short scramble. 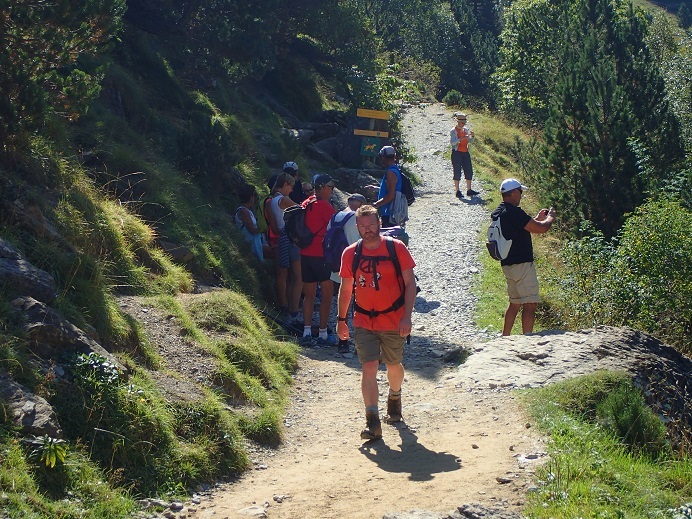 To get to the start of the ascent means losing a certain amount of height but without packs this wasn’t too much of a burden. 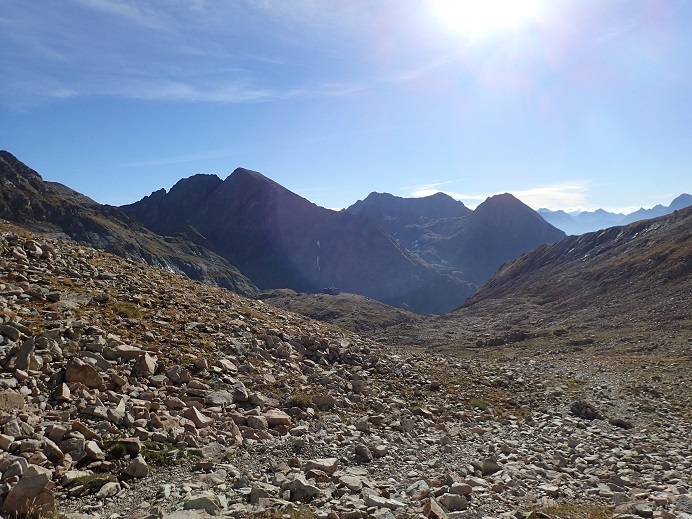 We were soon climbing the moraines and smoothed rock. 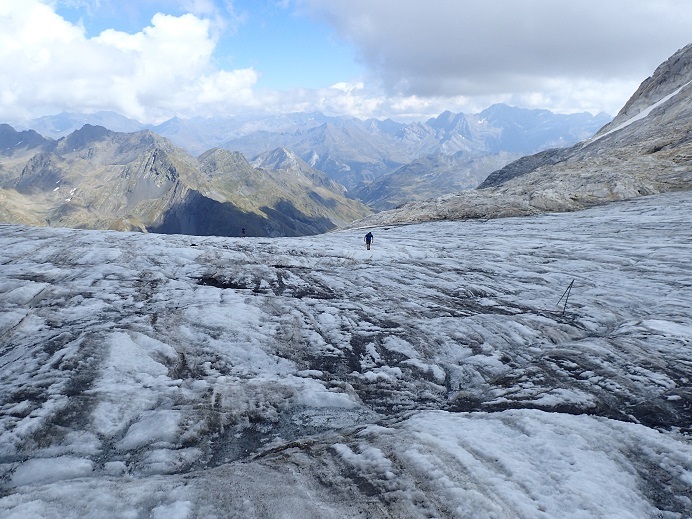 Sarah & Andy decided to sit & go no further, whilst the rest of us carried on over the ice. 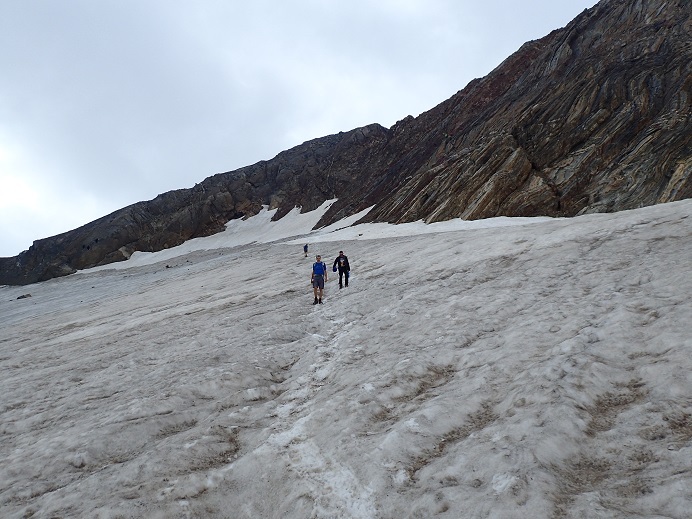 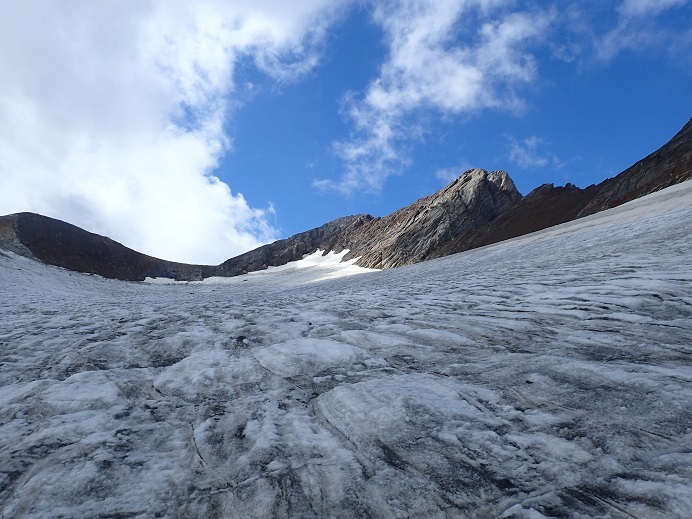 The glacier is quite benign & this year was very dry so the few small crevasses were easy to avoid. 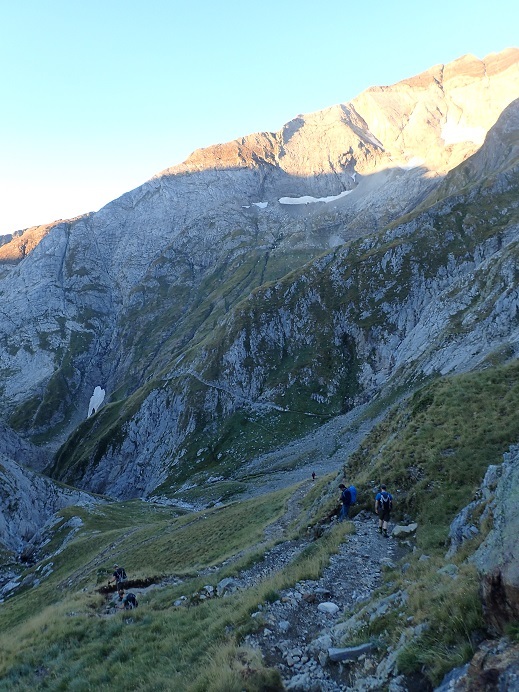 We were the last party to climb to the summit which was good as the scramble to the top is over loose rock & stonefall caused by other climbers is a real hazard when the route is busy. 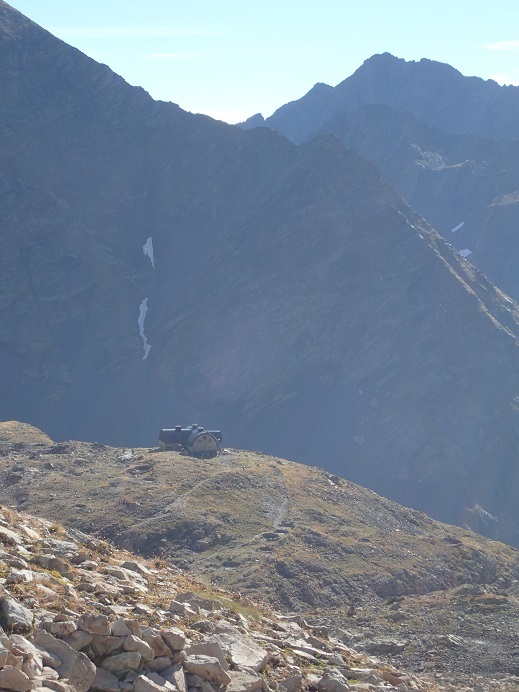 We had a short stay on top & headed back to the hut. 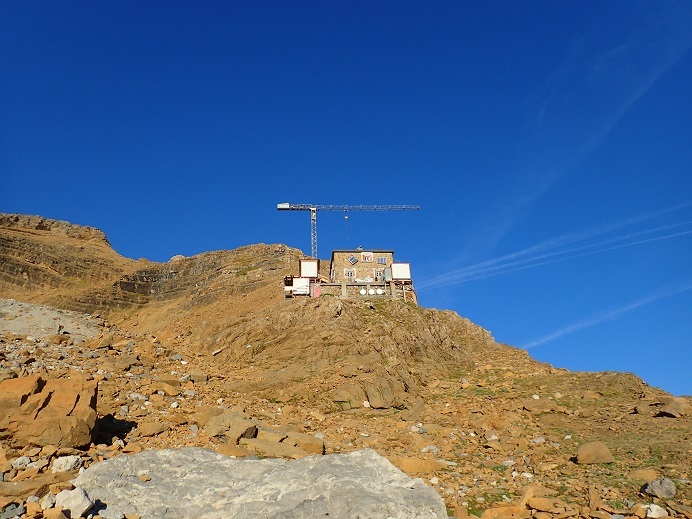 Sarah & Andy had gone from the edge of the ice – not as it turned out back to the hut but across to the summit of Montferrat 3221m on the opposite side of the Ossoue Cirque. 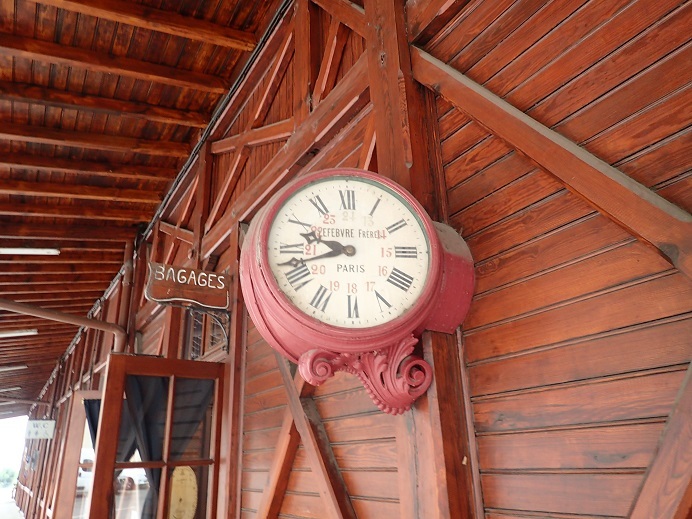 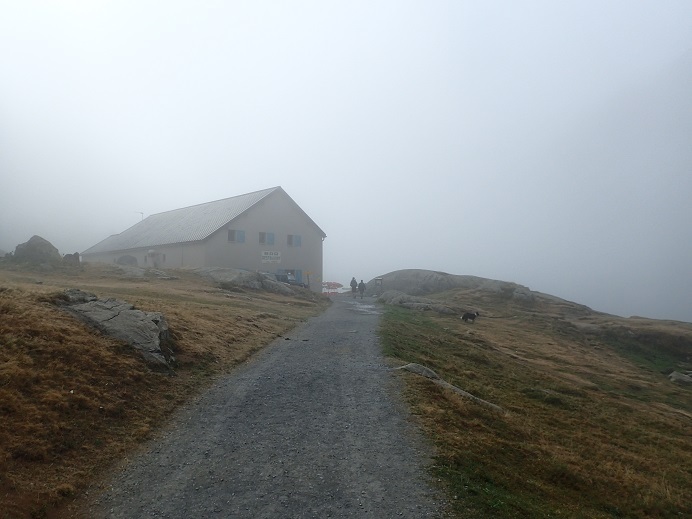 They only just made it in time for diner – the hut warden almost sending out a search party. 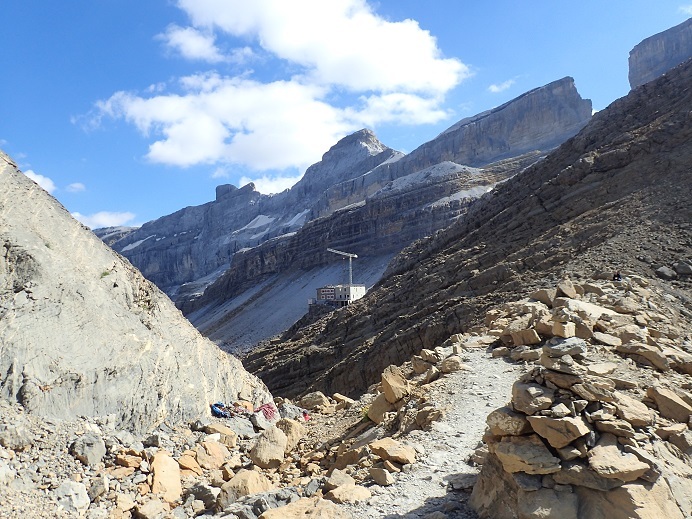 Lack of water at the hut meant the showers & toilets were shut, making for an ‘interesting’ time answering any calls of nature. 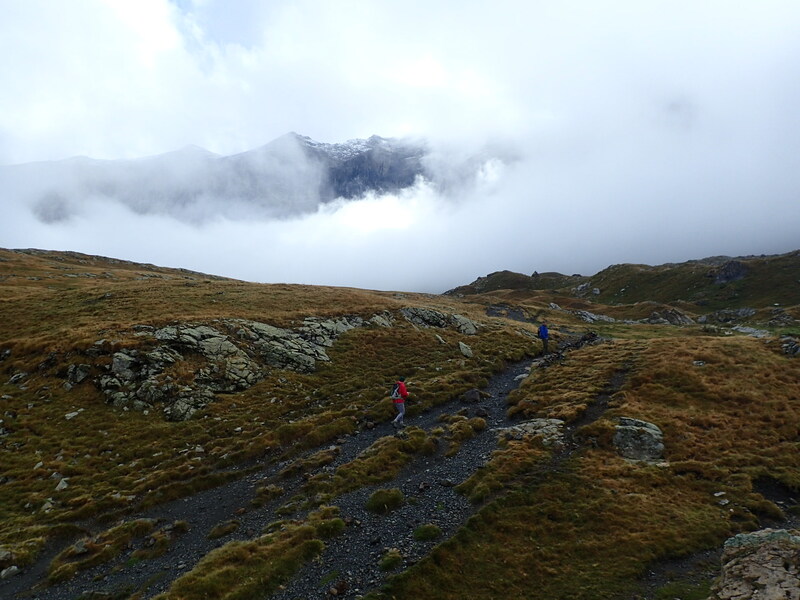 A long day ahead of us today about 15km or so – which it turned out was attempted three different ways. 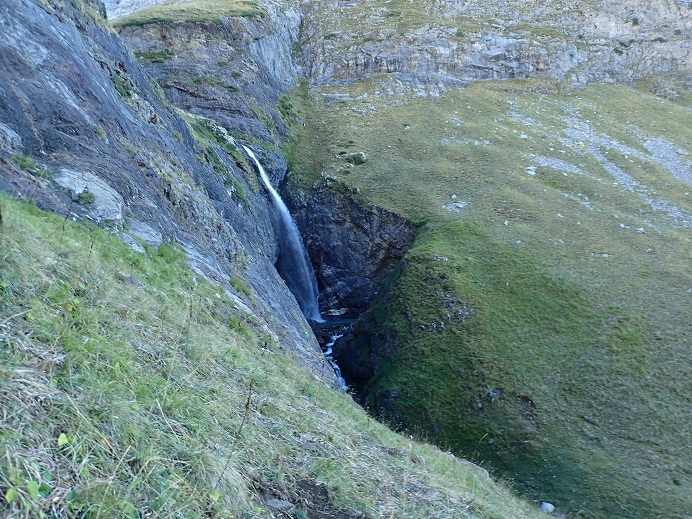 The entire group headed down the valley passing the caves blasted out of the rock for Count Henry Russell (a slightly eccentric English man who wished to live on the slopes of the Vignemale) and passing a fine cascade which brought out all the cameras. 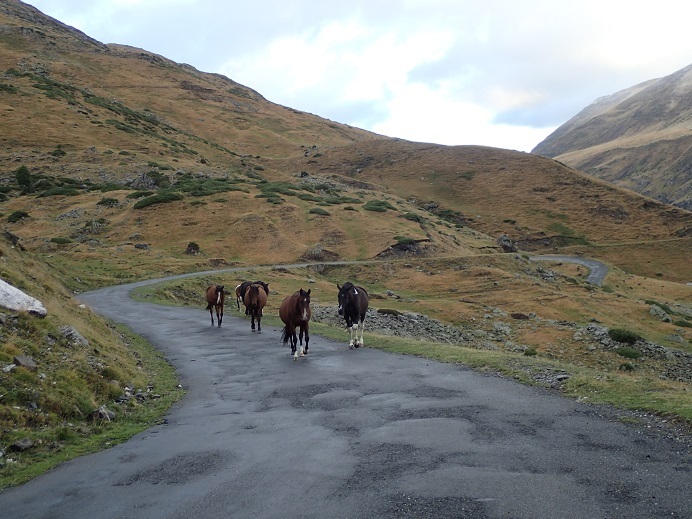 In the valley bottom we picked up the pace a little & were soon spread out. 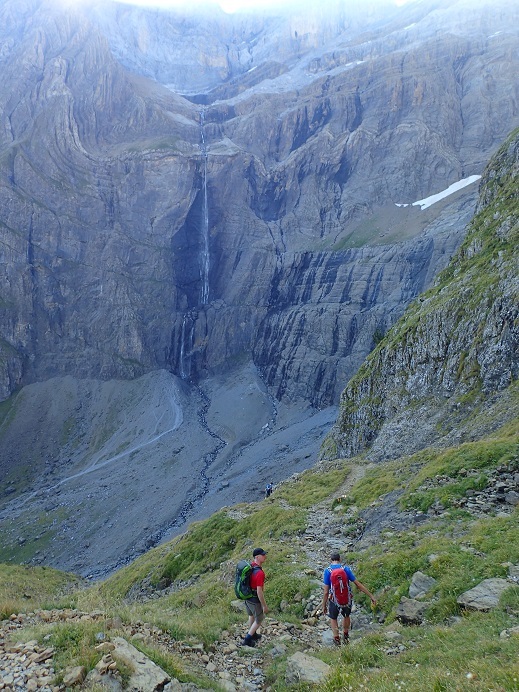 The two Dan’s, Dave & Steve opted for a direct route to the next hut, taking a straight line up the R flank of the Sausse Dessus valley wall. 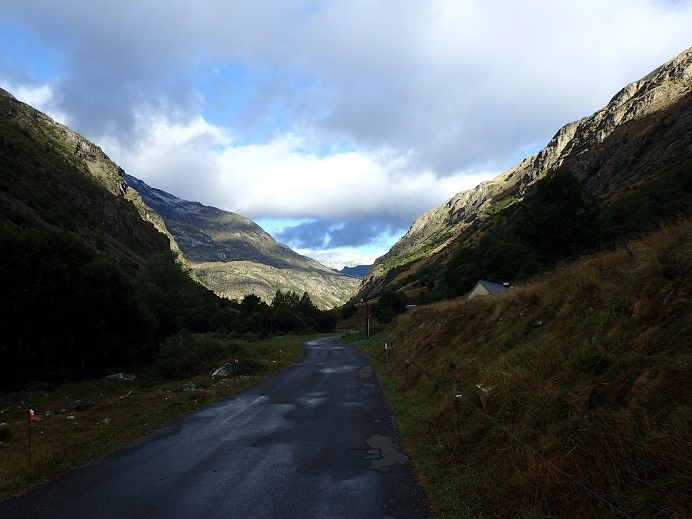 Andy & Sarah opted to try their luck hitching up the Especieres road to the car park ahead &, which raised a few eye brows. 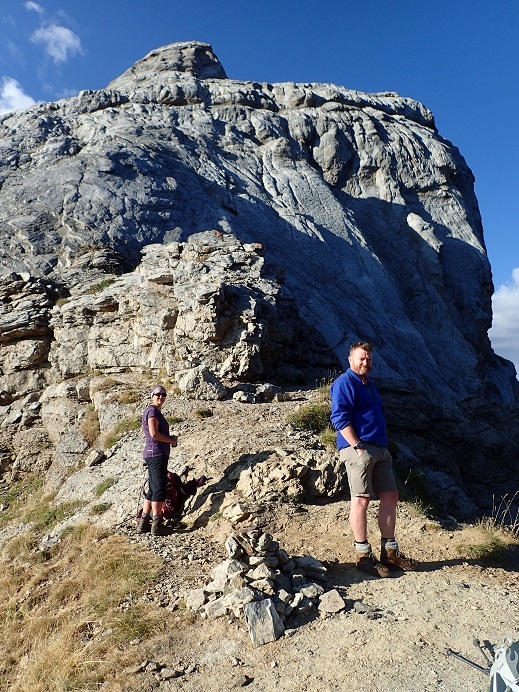 Alan, Claire Maggie & Simon had opted for a rather longer route taking in a long loop into Spain. 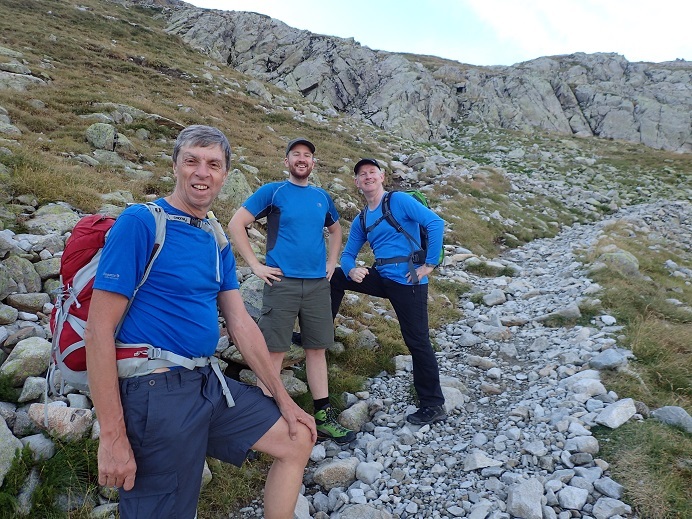 The 4 chaps made good time up the pathless valley side and were soon at the top on the ridge. 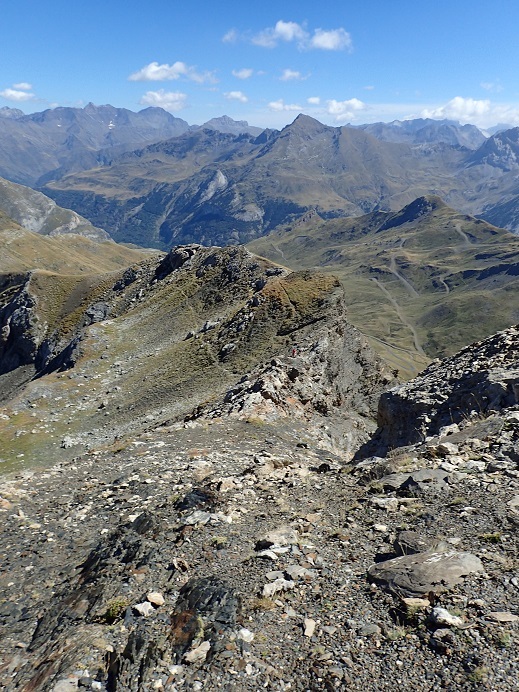 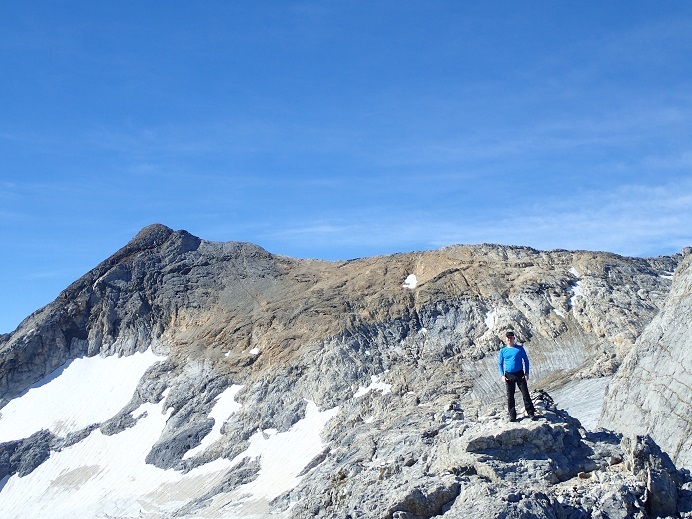 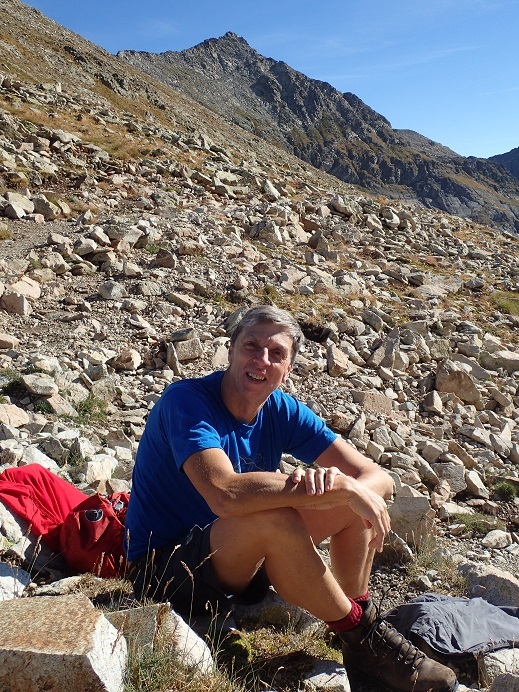 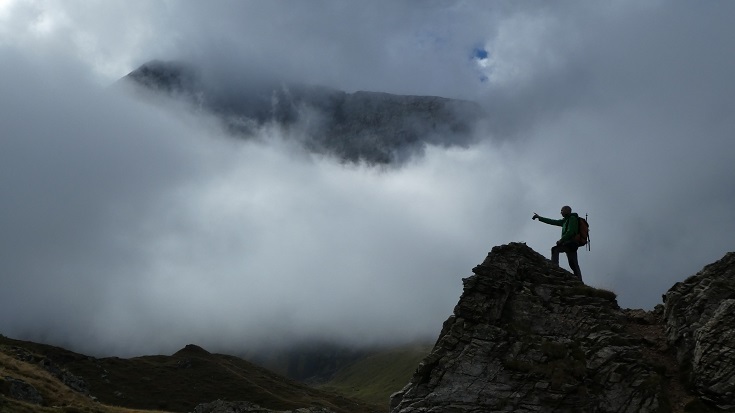 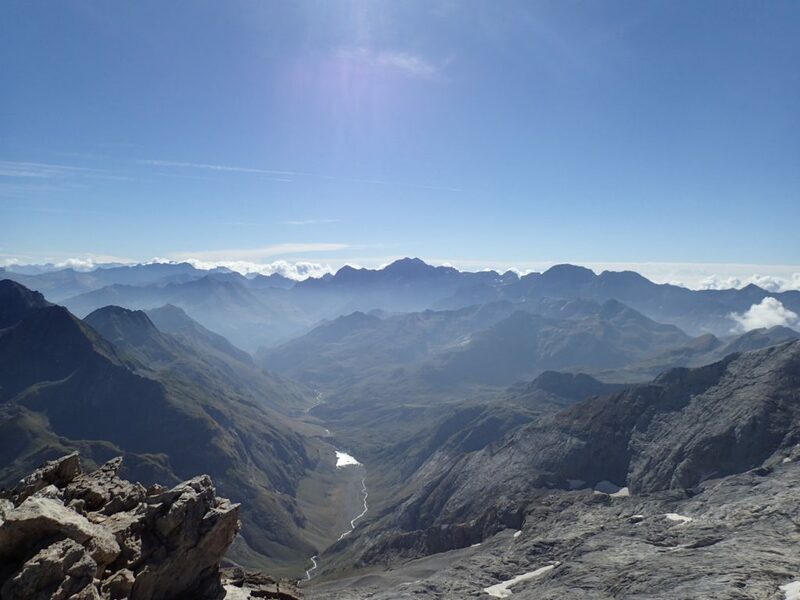 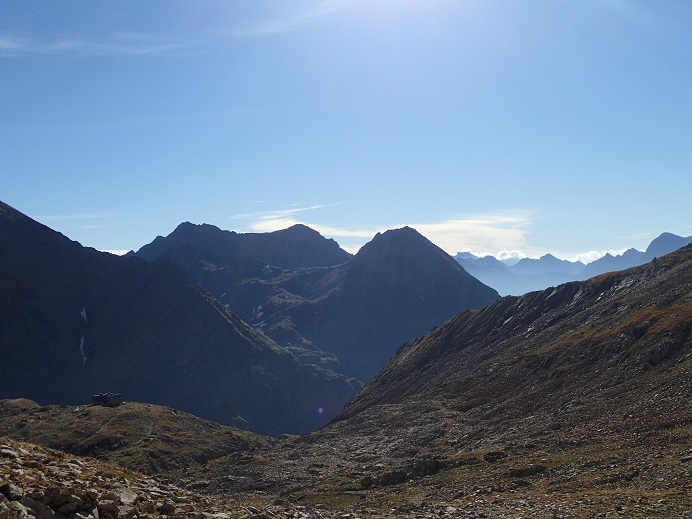 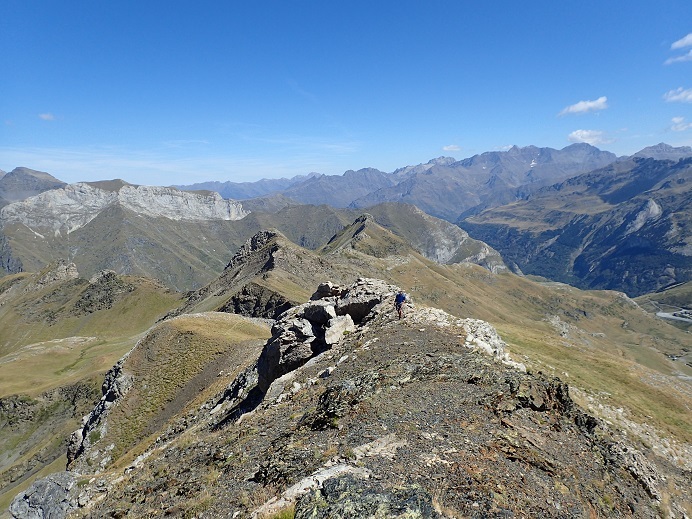 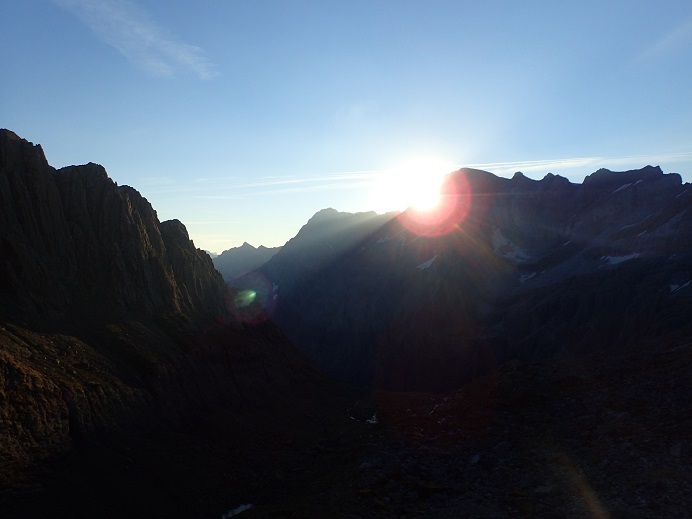 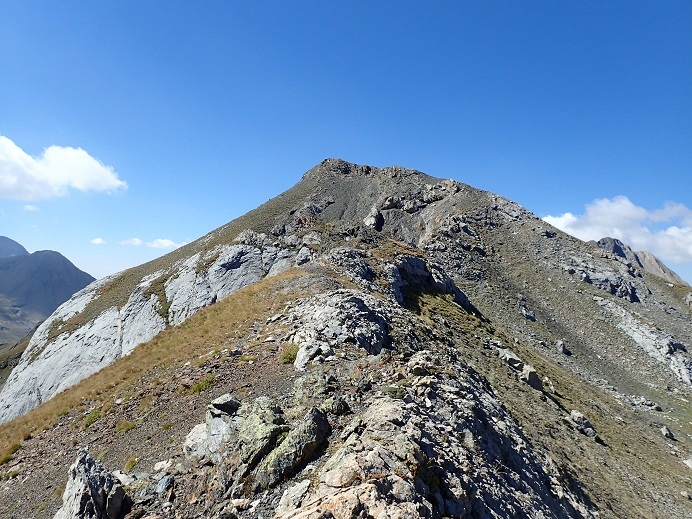 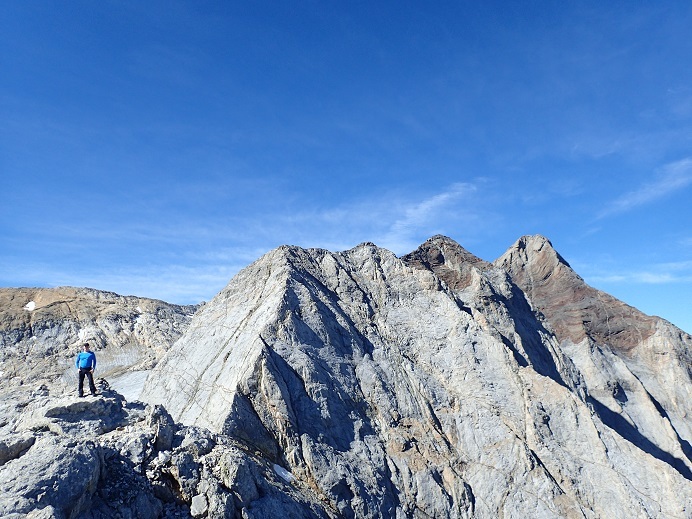 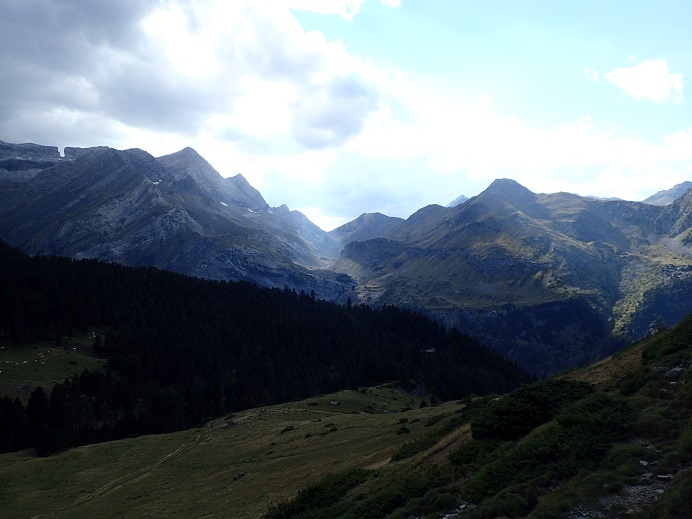 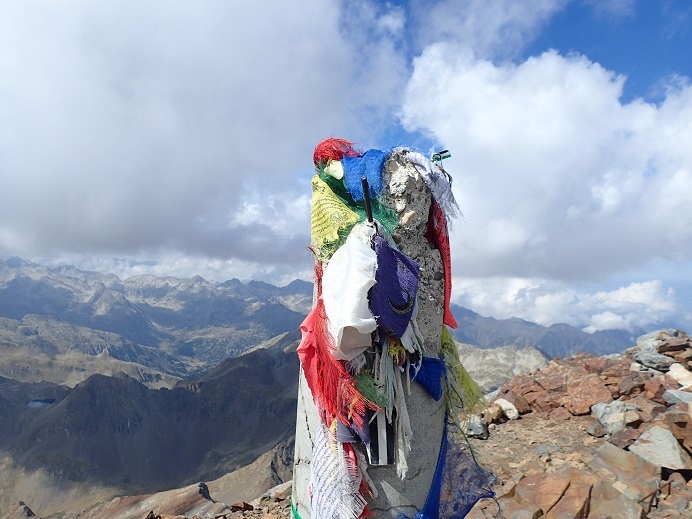 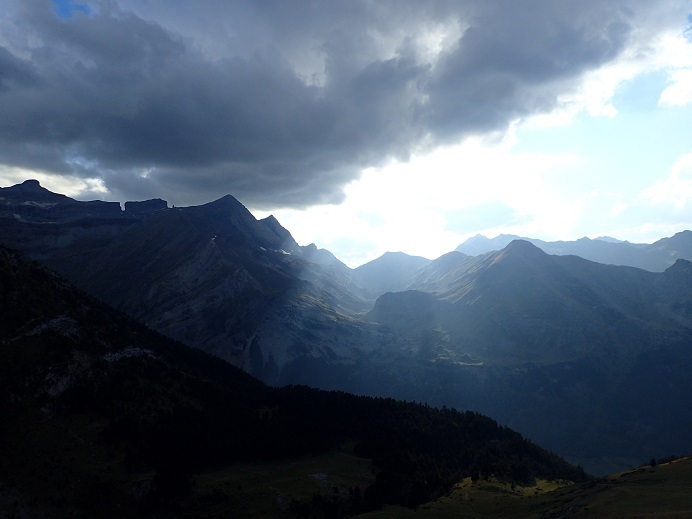 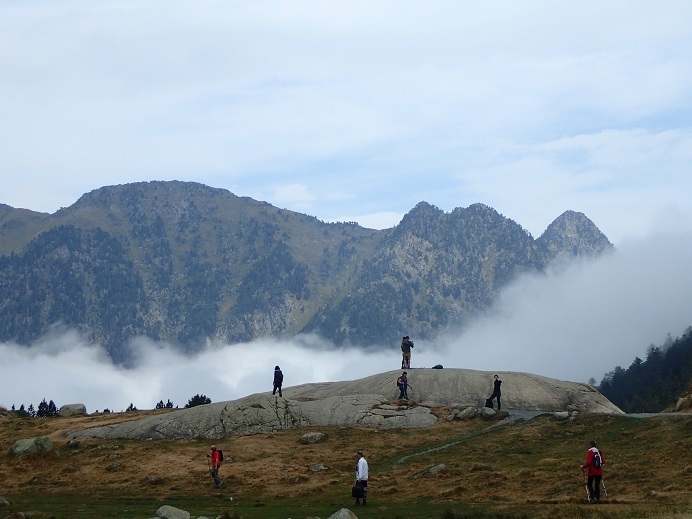 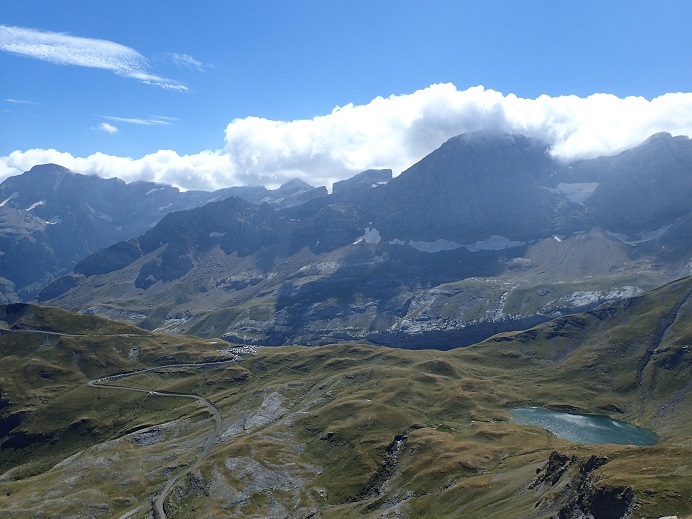 Their route now took in two summits – Pic Des Sant Andre 2608m & the Pic Entre Les Portes 2477m. 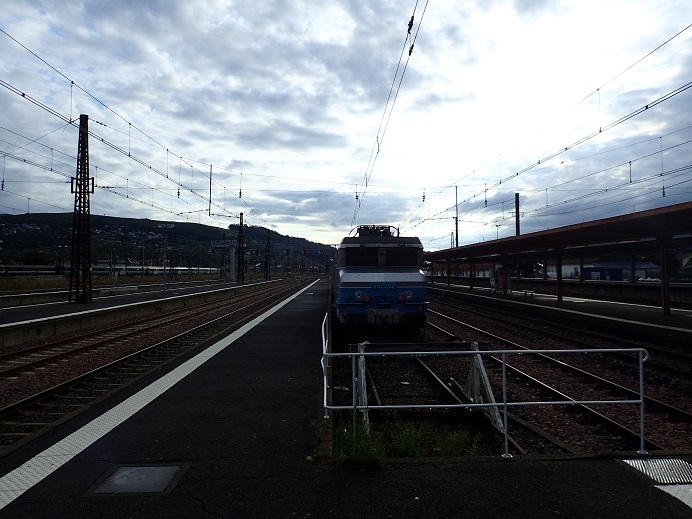 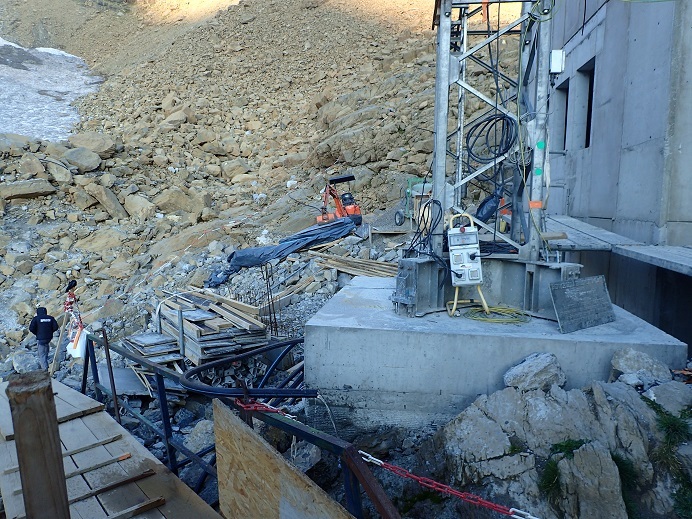 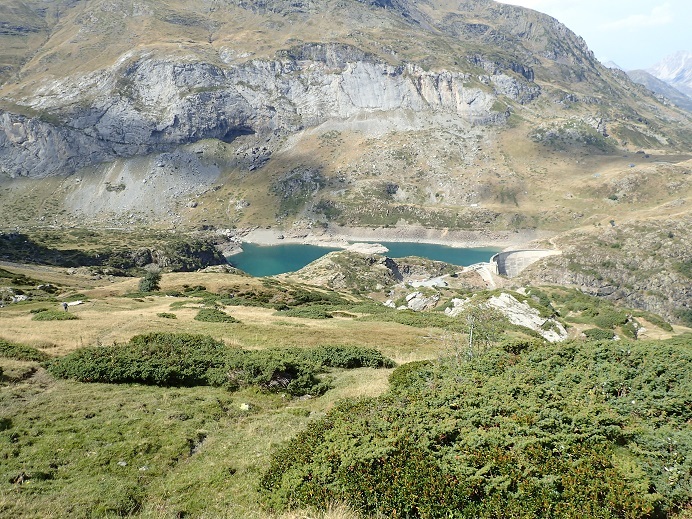 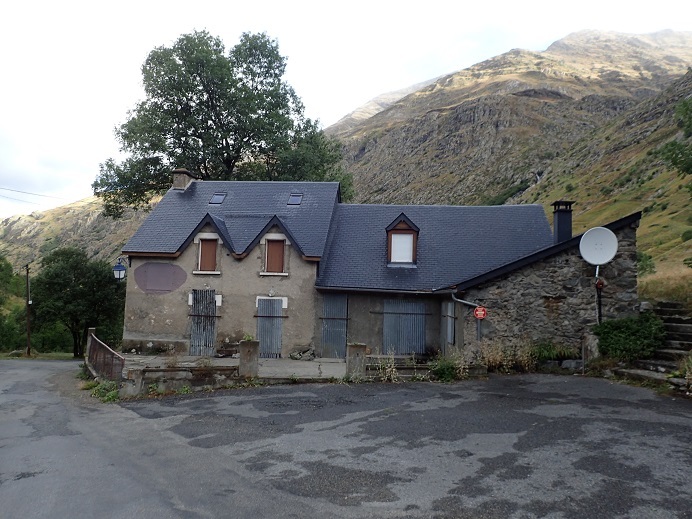 We were now at the Port de Boucharo & within a final few km of the hut. 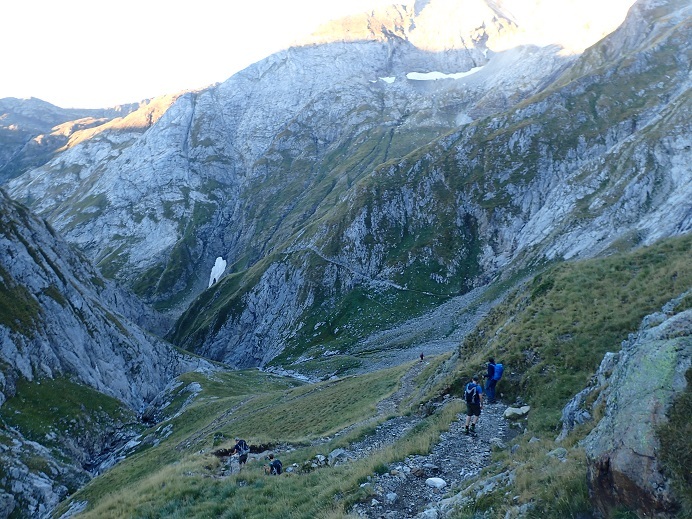 Catching Andy & Sarah on the final climb to the hut the first part of the party arrived in good time for several beers. 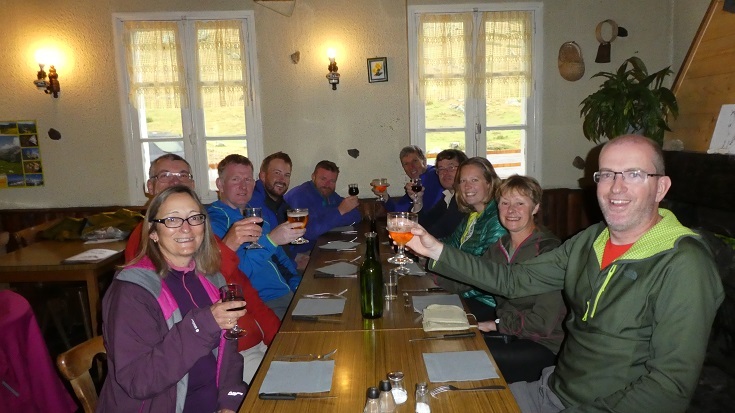 Later, much, much later the rest of the group arrived again just in time for diner having had a fine day out in Spain. 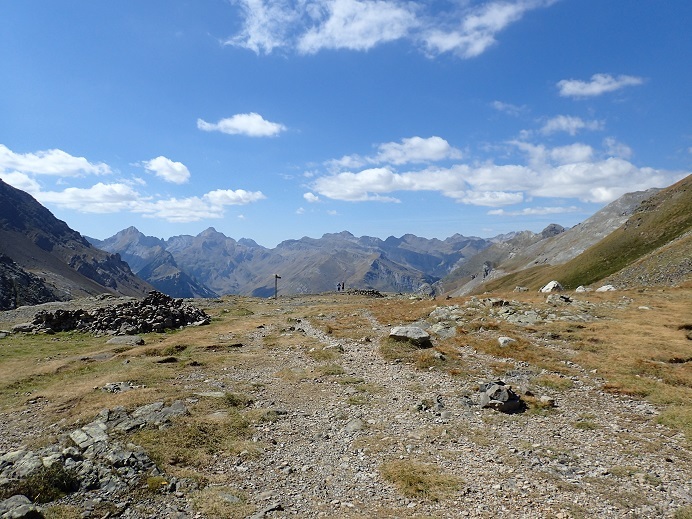 Despite the Sarradets Refuge sitting in a fine position just below the Breche du Roland I was the only person who decided to tackle the 300m climb to the top. 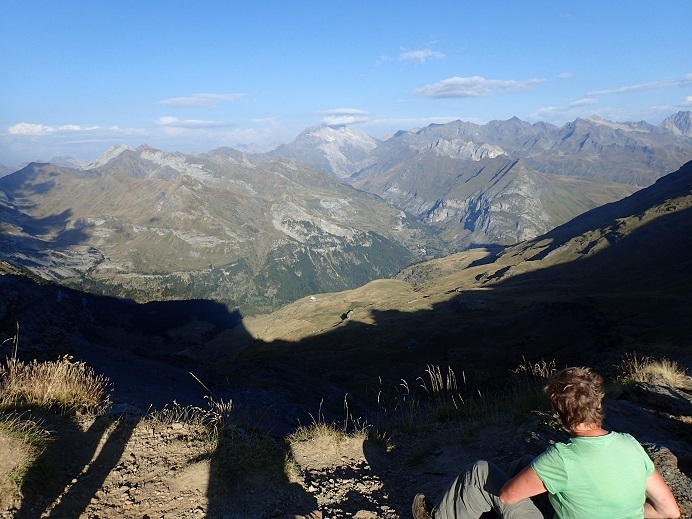 The views were stunning & worth the effort. 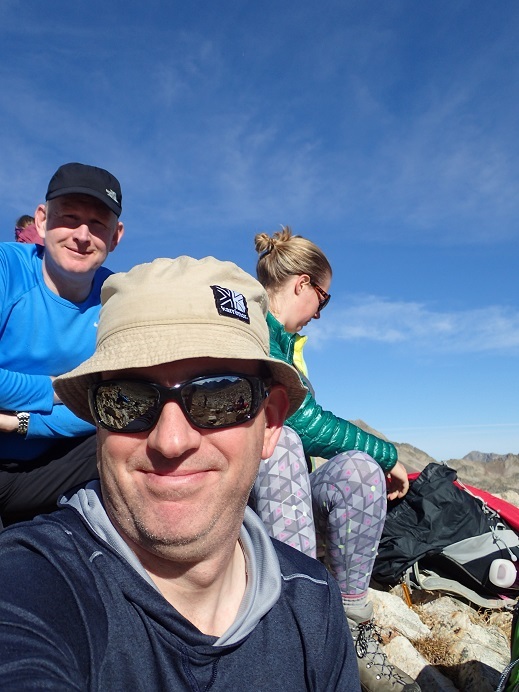 However, there was the chance of lunch at the Hotel in the valley, so lazing in the early morning sun was not an option. 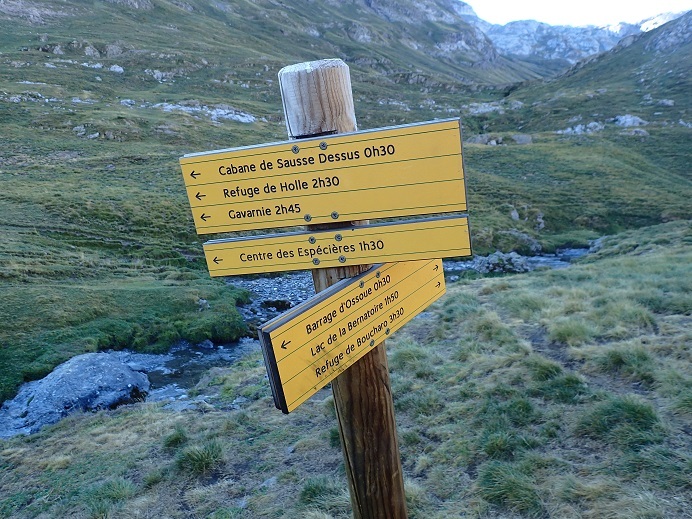 The path to the valley floor involves a very steep descent of the Echelle de Sarradets which is steep enough to warrant being marked in dots on the IGN map. 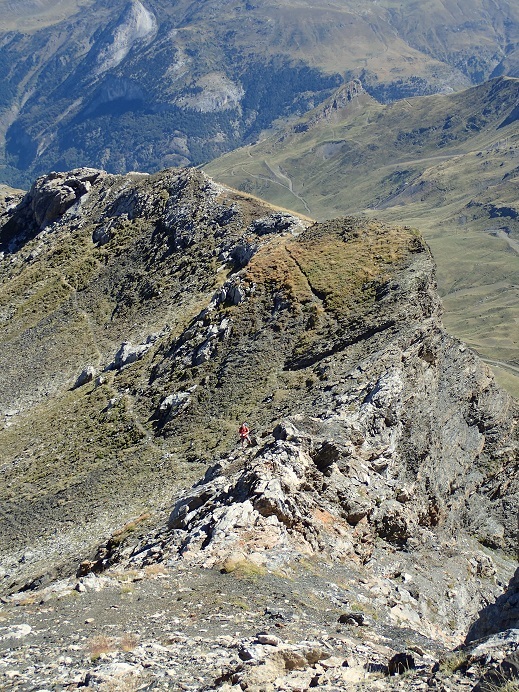 It lived up to its reputation, with Sarah taking a slightly off route option (red crosses should not be followed) and giving herself a bit of a fright. 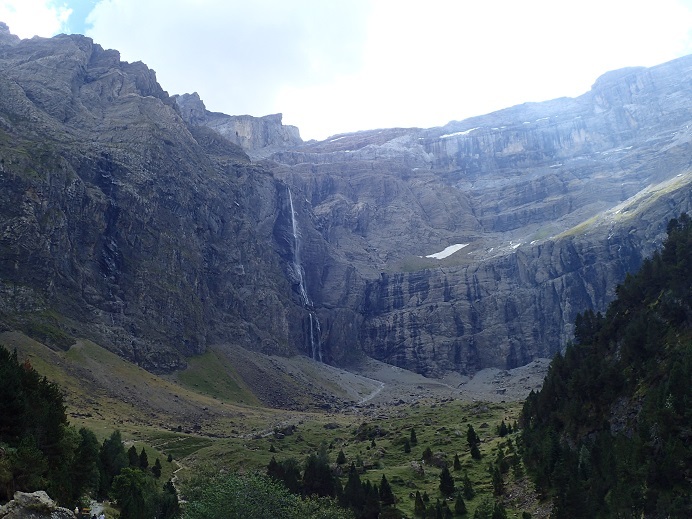 However we were soon back on track & in the valley floor below the impressive Grande Cascade which brings so many tourists to the small village of Gavarnie. 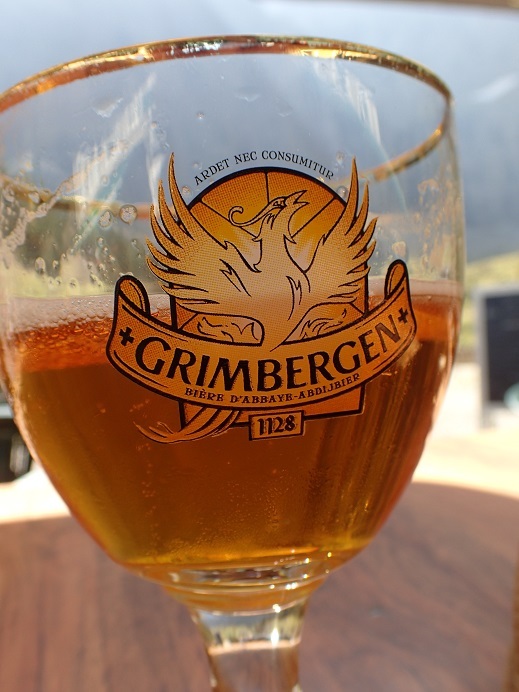 We got a good table on the Hotel terrace & ordered beer & food as the group re united. 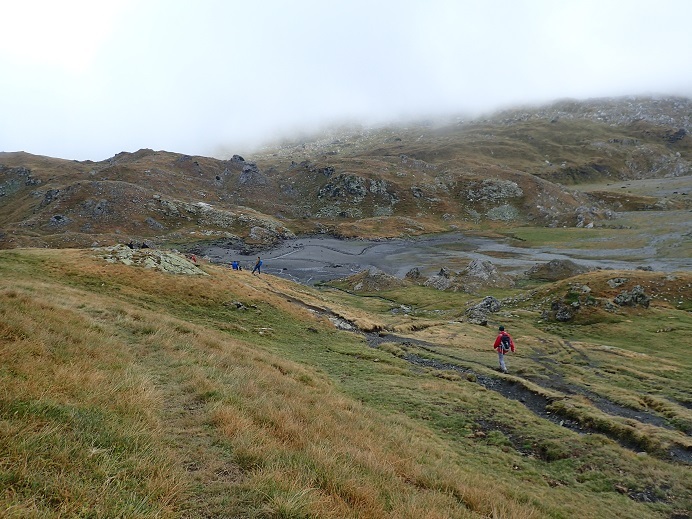 Setting off separately however we began the short climb to our hut. 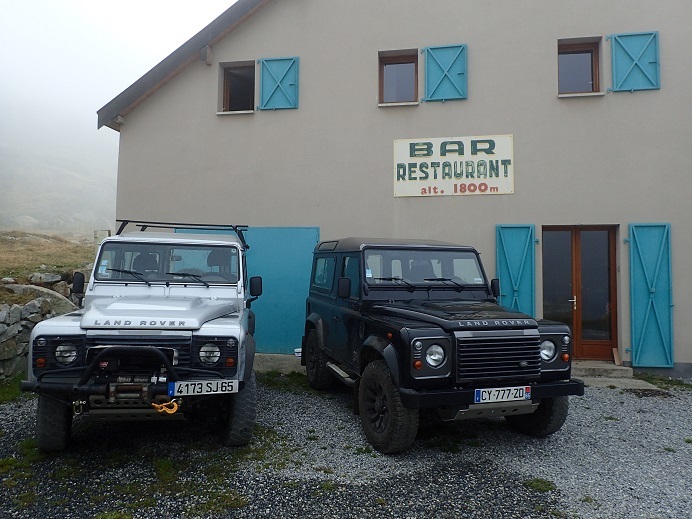 Luckily the Cider House which we had frequented with a passion (for the 2€ hot showers of course) eight years previously was again open & it seemed only natural to stop & have a few ciders for old times. 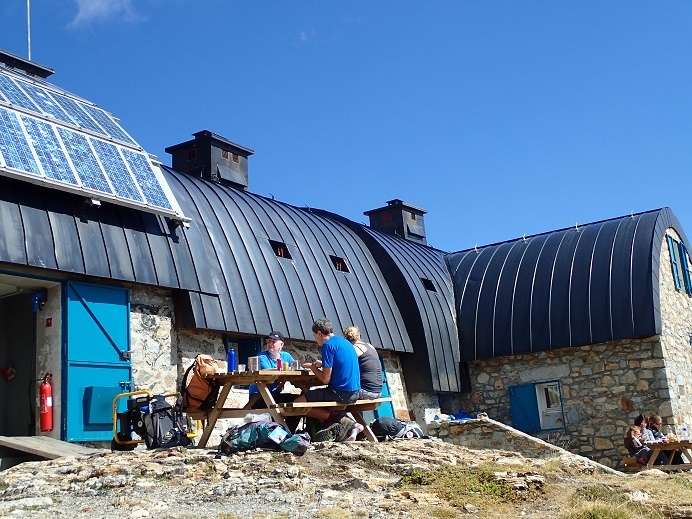 Again the chap running the hut didn’t believe that we wanted a bottle of cider each (they are 75cl ) and seemed amazed when we ordered a second round. 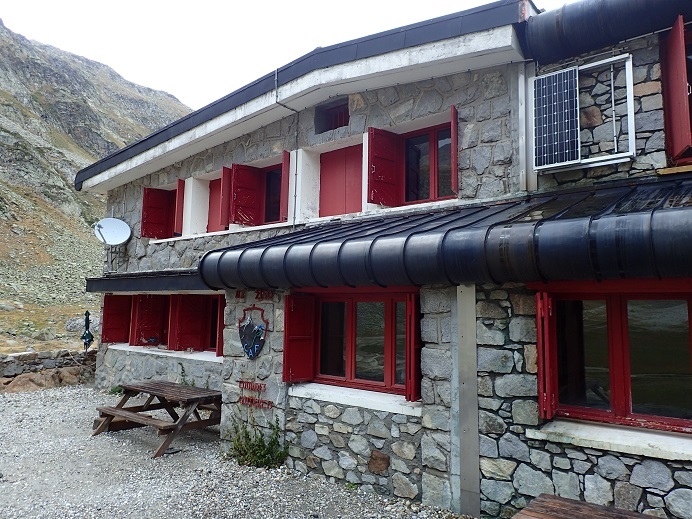 He took a shine to Maggie who confused him further by asking to see the accommodation. 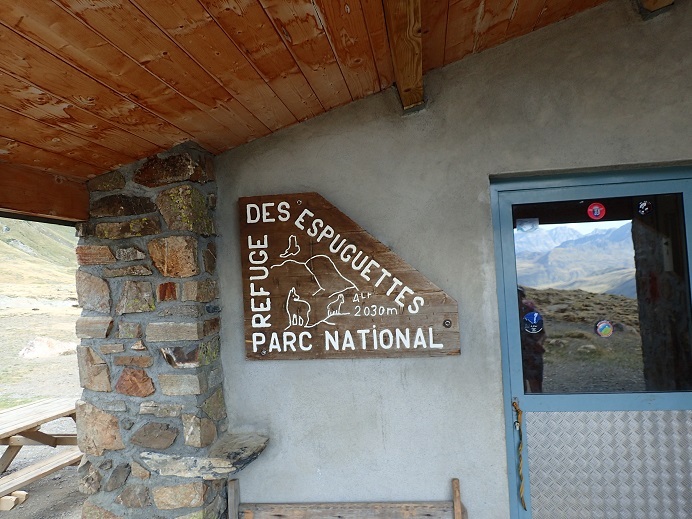 A short hike uphill saw as at our hut the Park Authority owned Refuge Espuguettes. 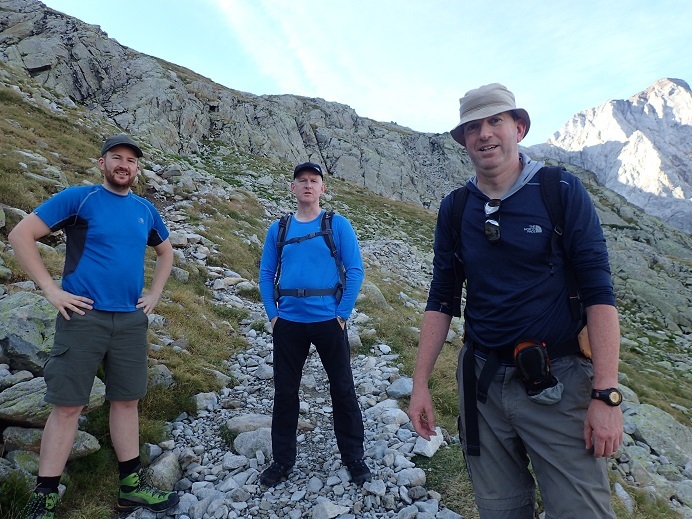 Another longish day, but one which was mainly downhill. 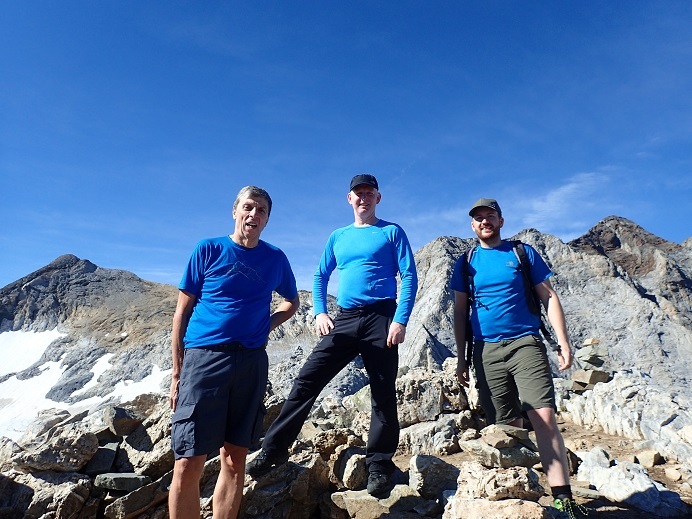 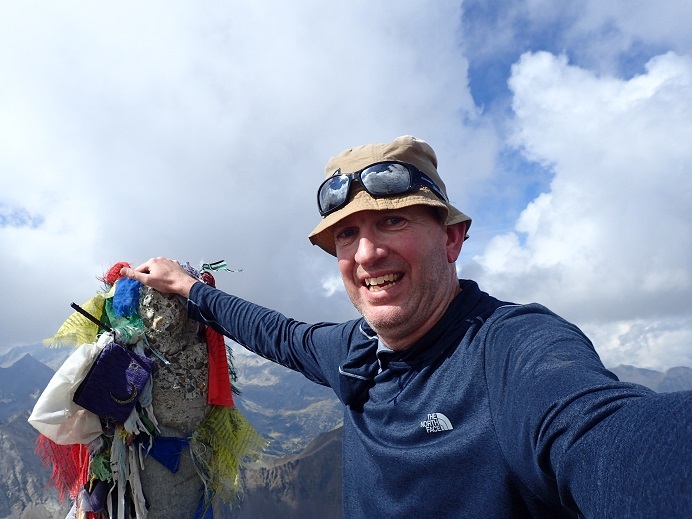 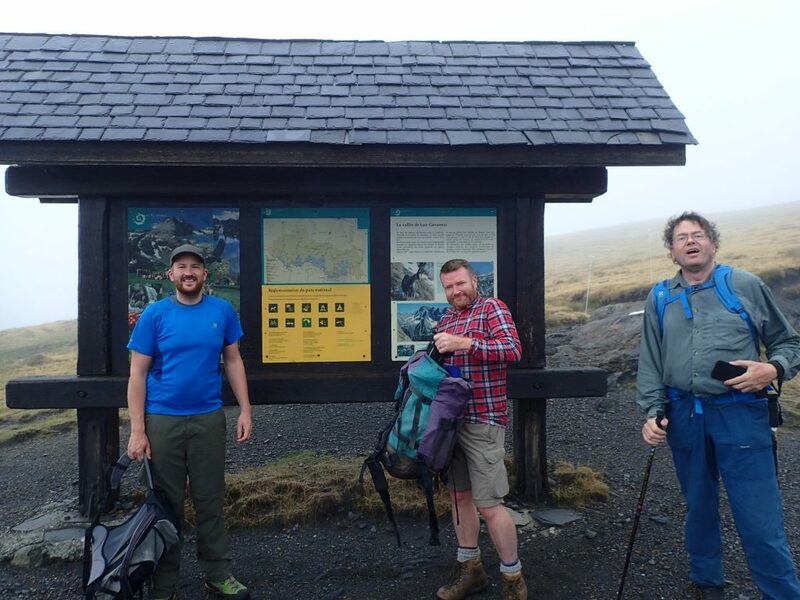 We set off early and some of the group (Dan S & Andy) decided to bag the only summit near to our route for the day – Pimine 2801m. 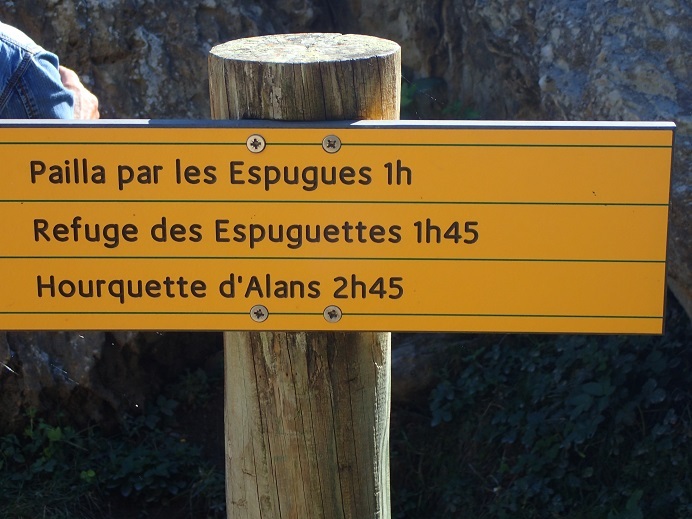 The rest of the group continued on up to the Horquette d’Alans. 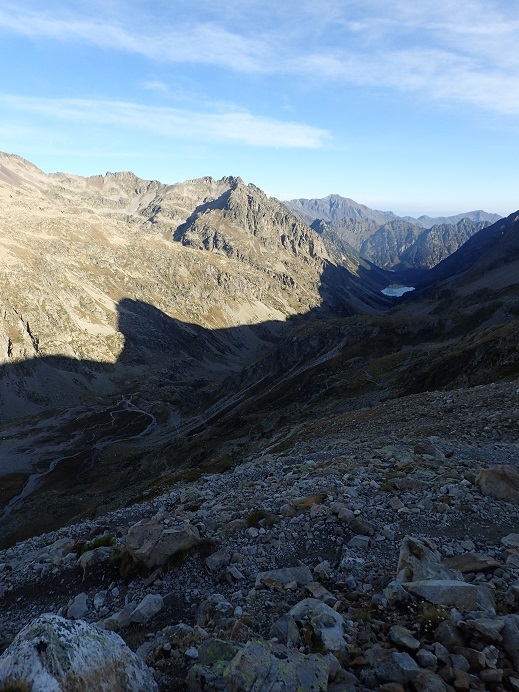 From the col it was a long 4km descent to the Gloriettes Lake, but a descent through attractive scenery. 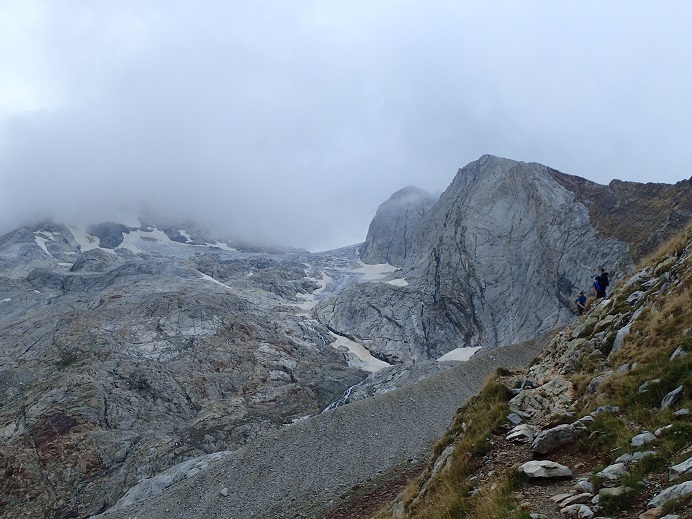 The group was spread out over the mountainside, but the weather had cleared & the route straightforward. 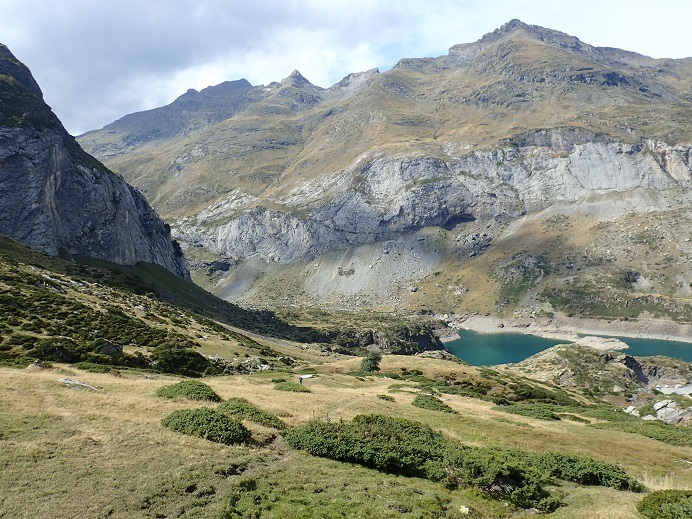 From the lake there was a short steep climb around into the Heas valley where our accommodation was situated. 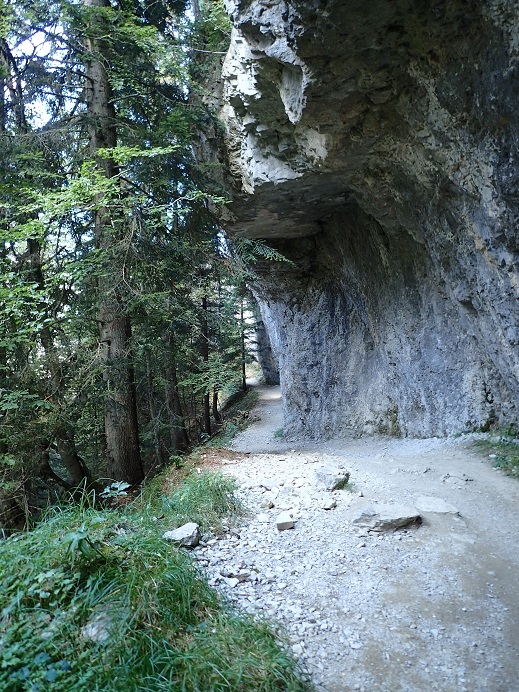 The path to the hut split & so I left a very fine arrow & sign, made from stones lying on the path side to point the way – but no one saw it. 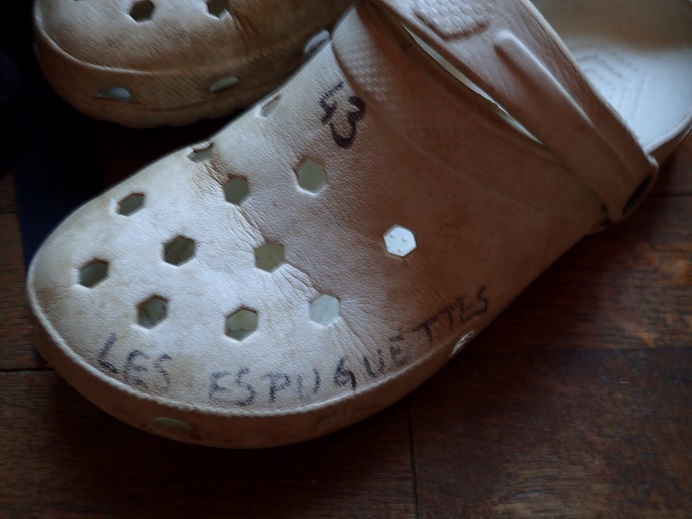 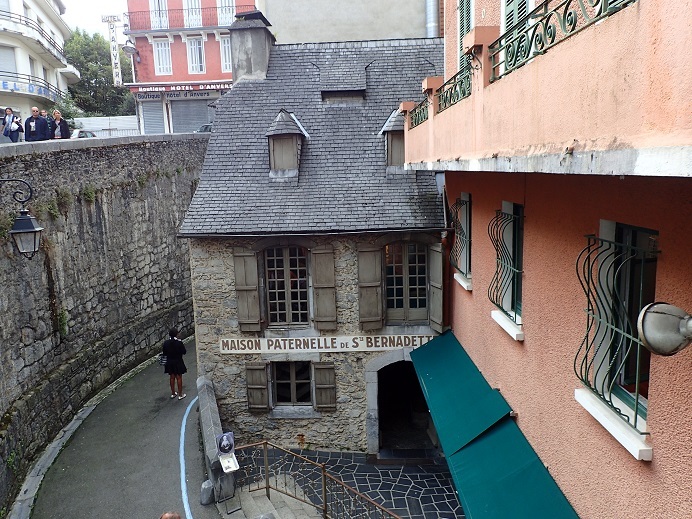 Arriving at the Auberge du Maillet & finding the owner had such a strong local accent he was unintelligible the group arrived one by one. 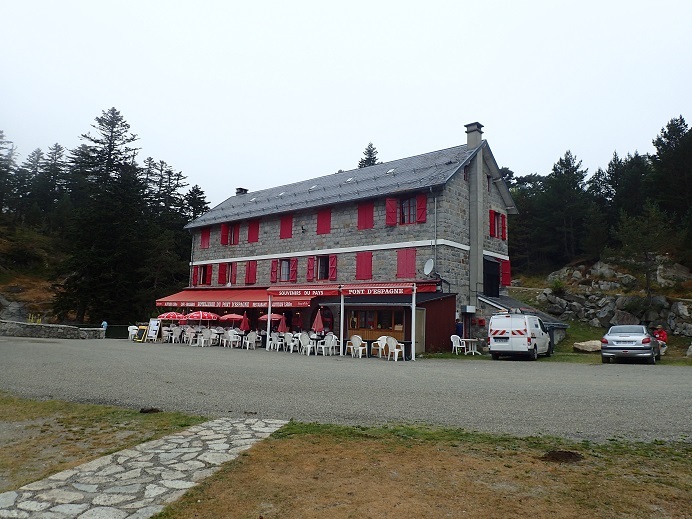 Due to a large number of French pensioners also wanting to stay in the bunkroom, most of our group upgraded to rooms in the hotel itself. 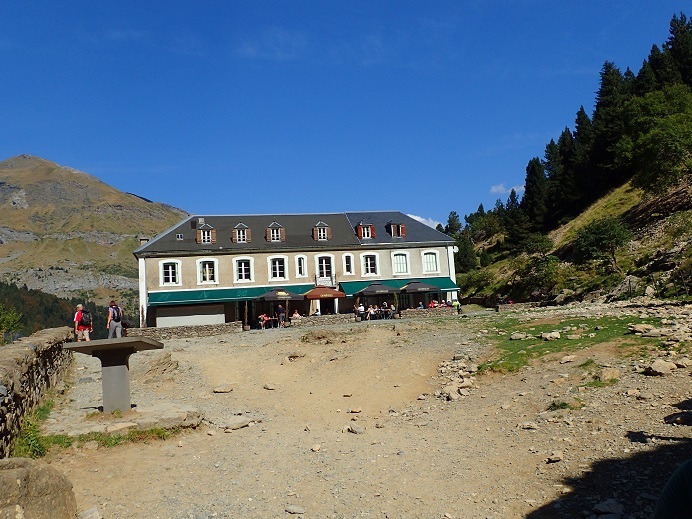 The afternoon was spent either in the bar or walking up to the Cirque above the Auberge. 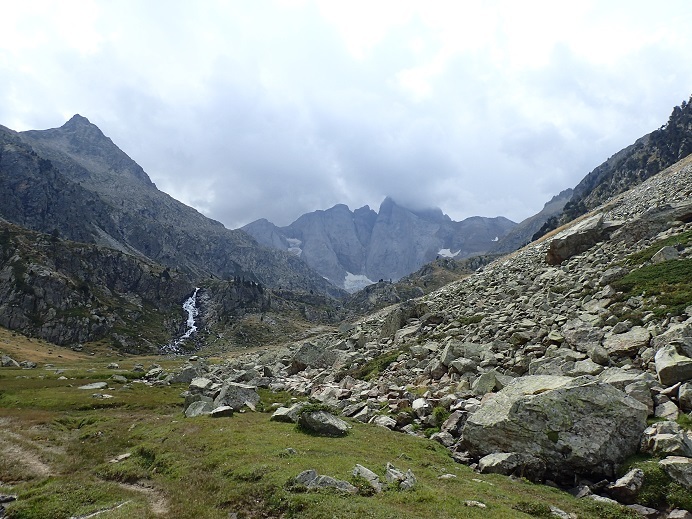 On fine days it is a stunning location, but the weather was not kind to us. 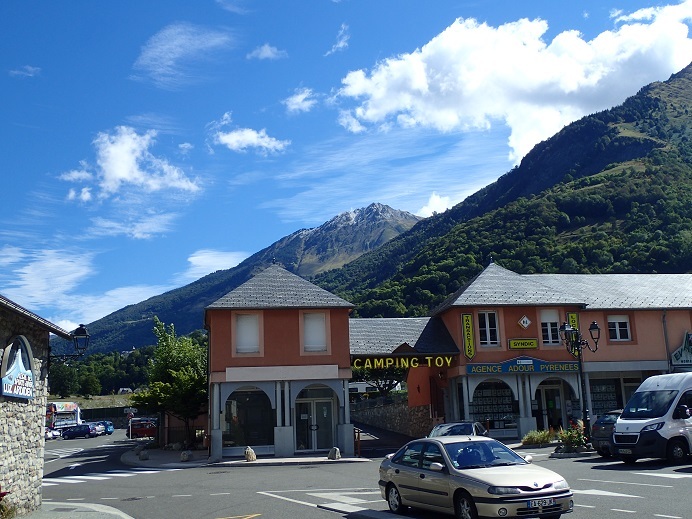 We had a second night at the Auberge, so today was a much easier day where we could leave most of our stuff in the hotel & travel light. 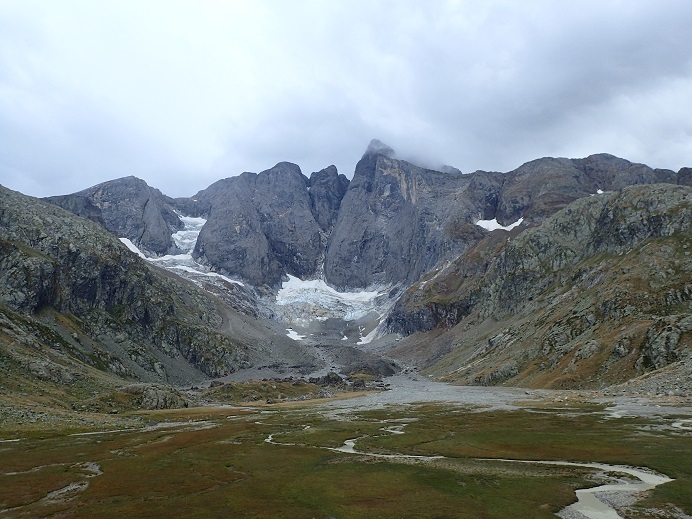 The weather was not too good with low cloud & rain so the plan was to hike up to the Cirque & play it by ear from there. 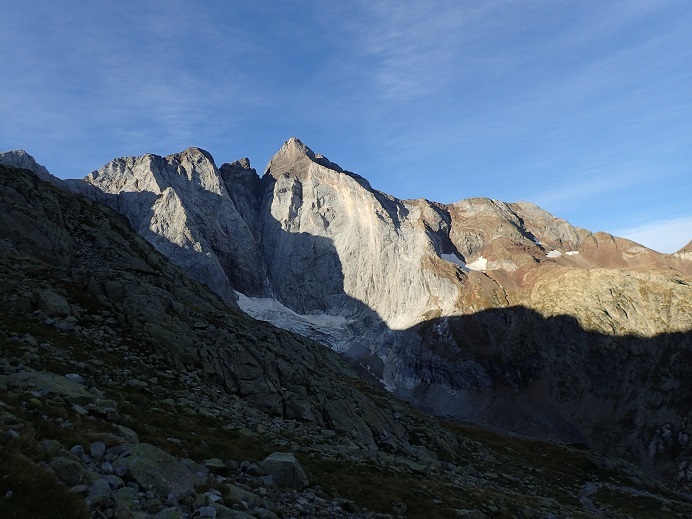 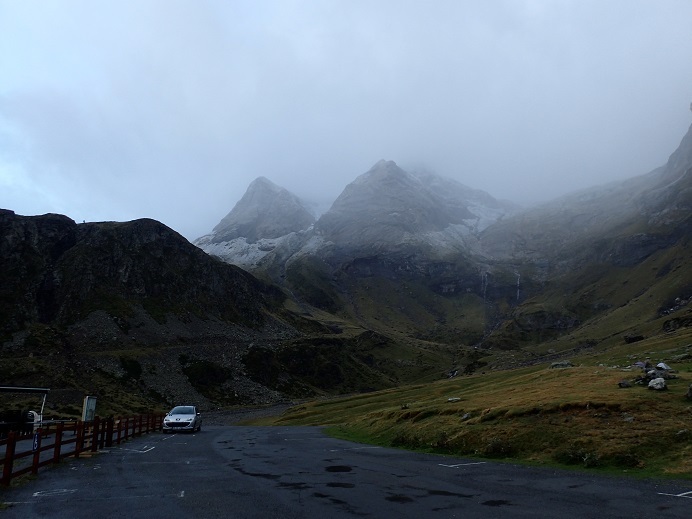 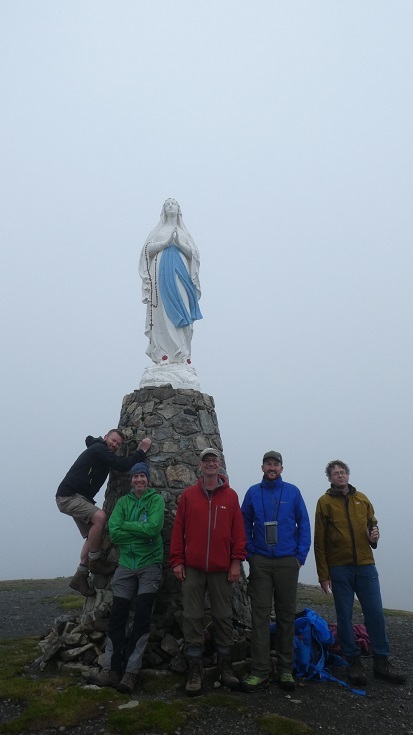 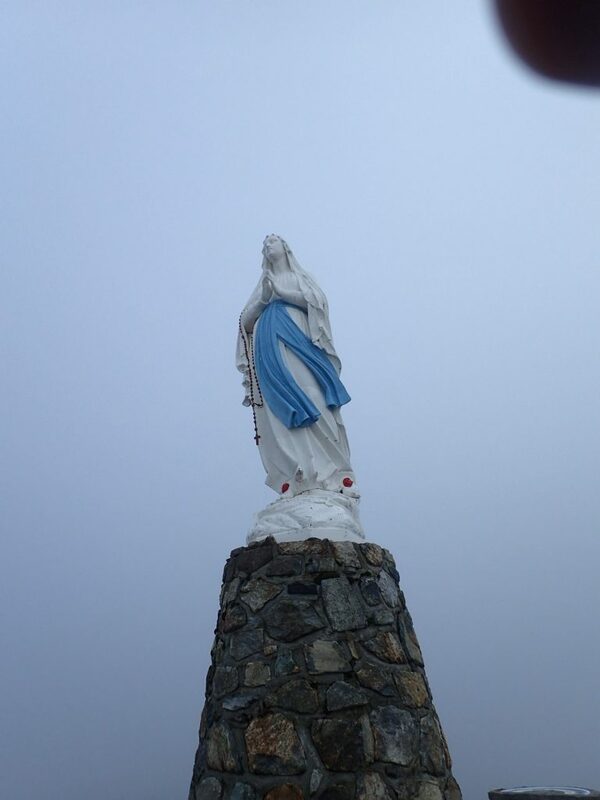 In the Cirque is a large Madonna – the Vierge du Troumouse which we headed for first in the thick mist. 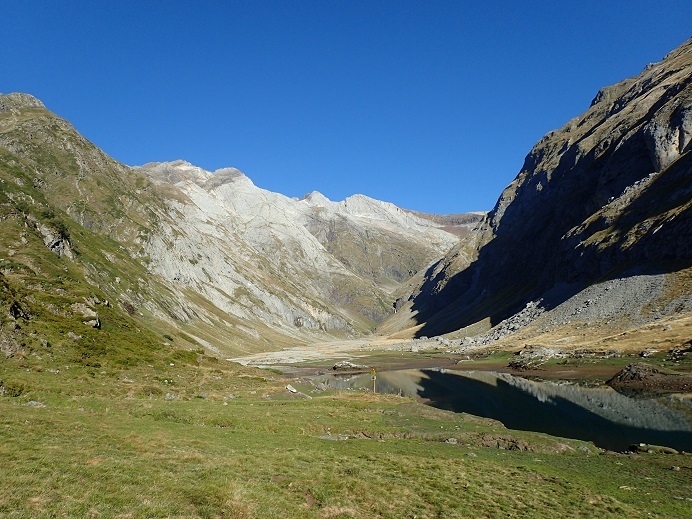 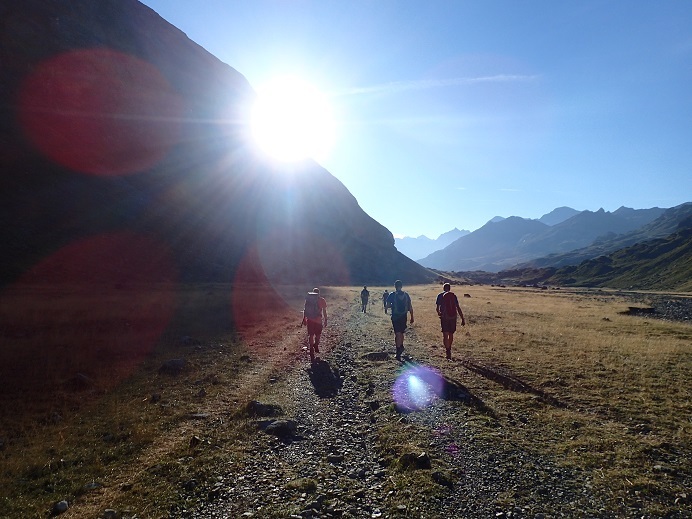 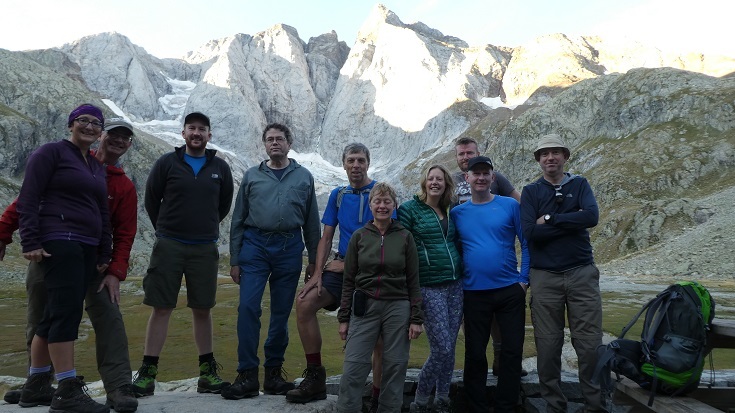 We continued on round to the Lac des Aires & here we split – some wanting to head back, others to continue round the Cirque. 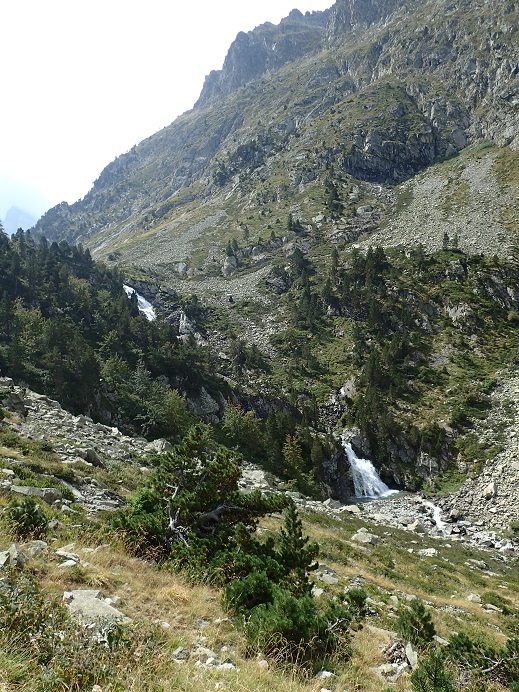 I decided on a reconnoitre of the route up to the Pic de la Munia. 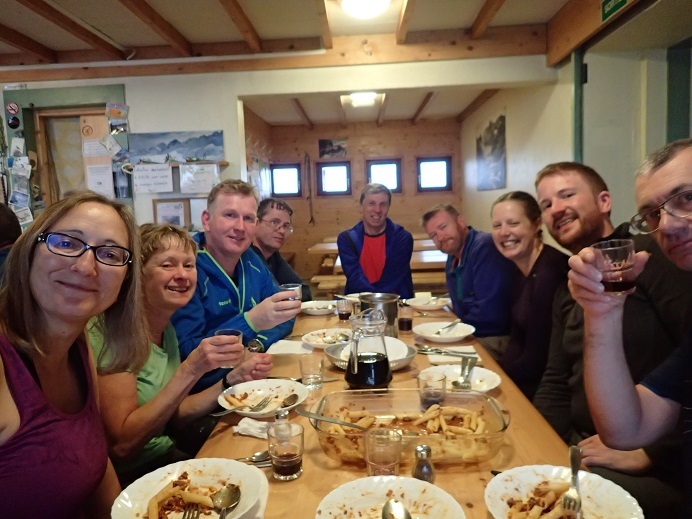 The weather never improved so we all ended up back to the Auberge over the course of the afternoon where hot chocolate & wine passed the time. 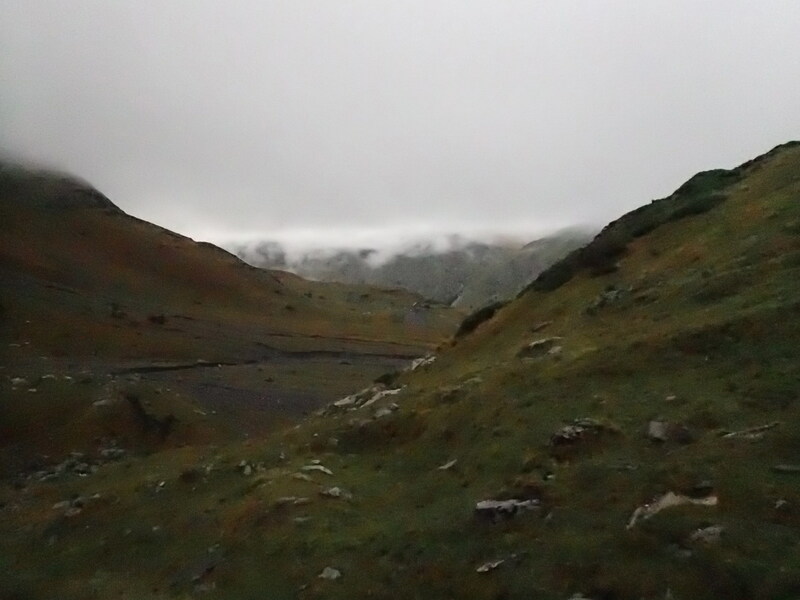 Today was our last day in the hills. 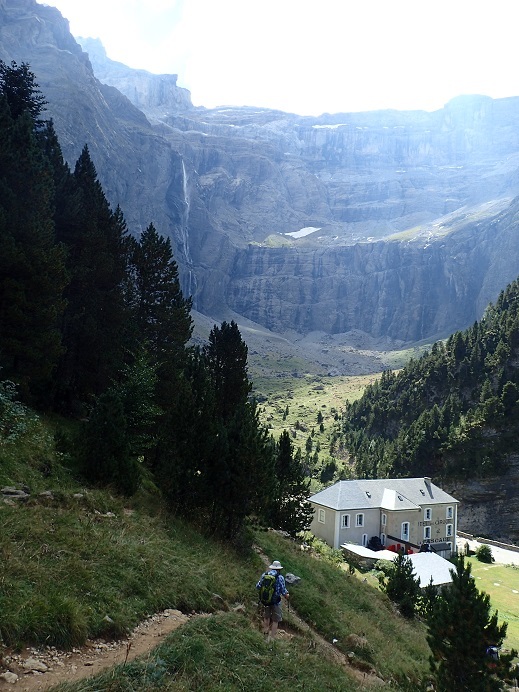 Dave had to get to Lourdes for a train, so he left early to walk down the valley road. 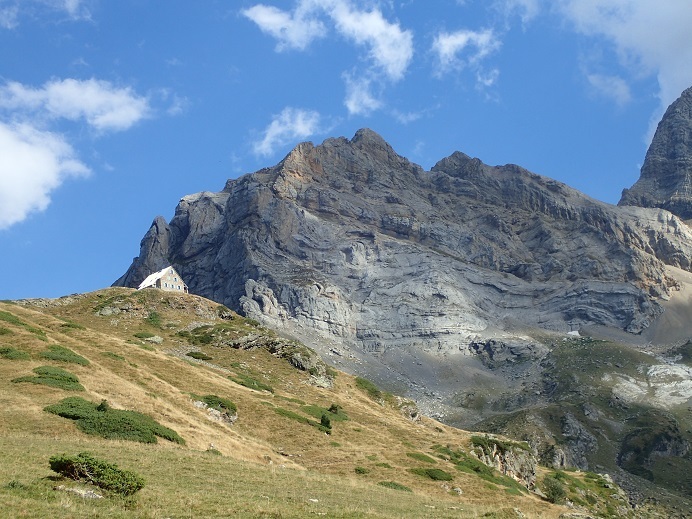 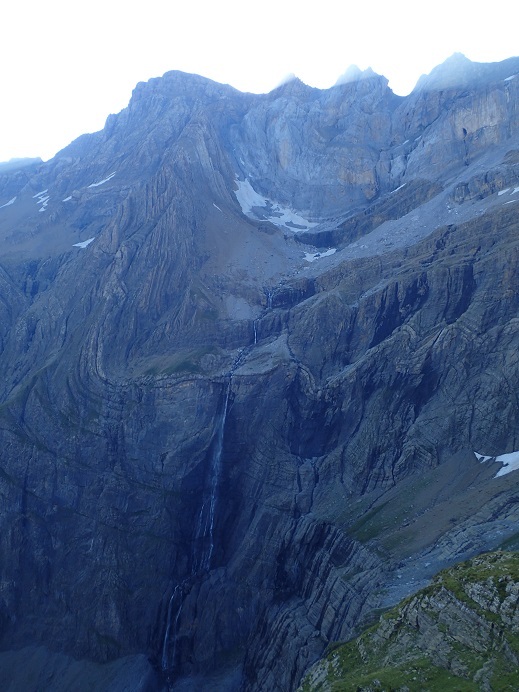 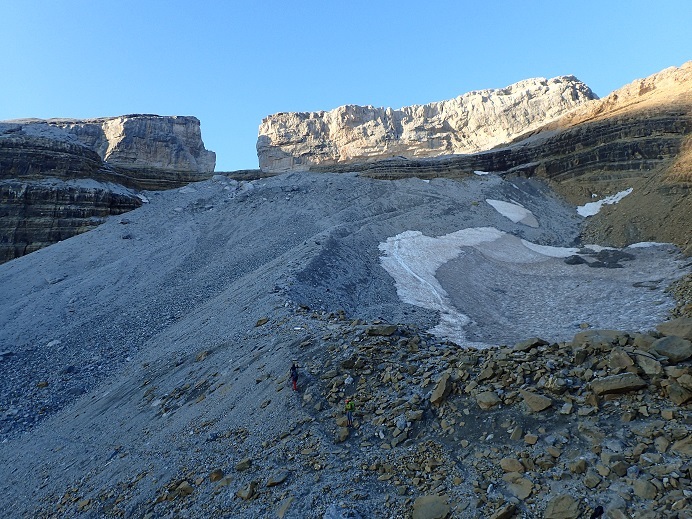 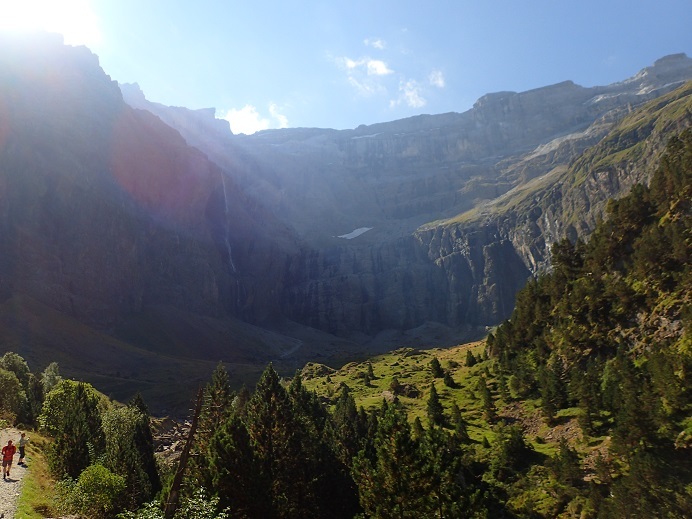 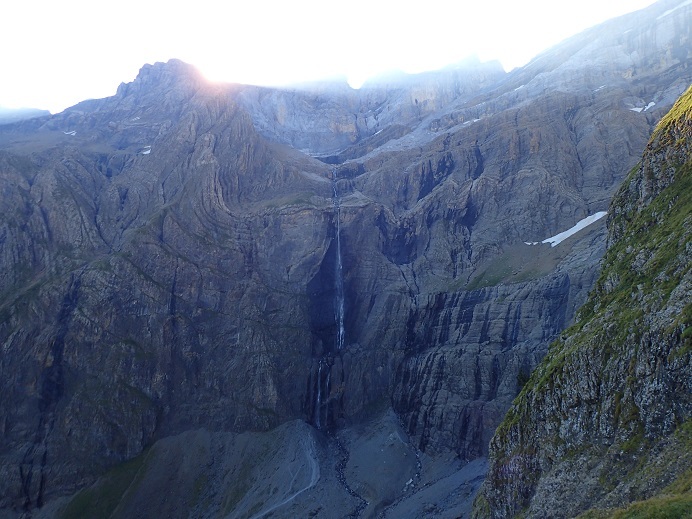 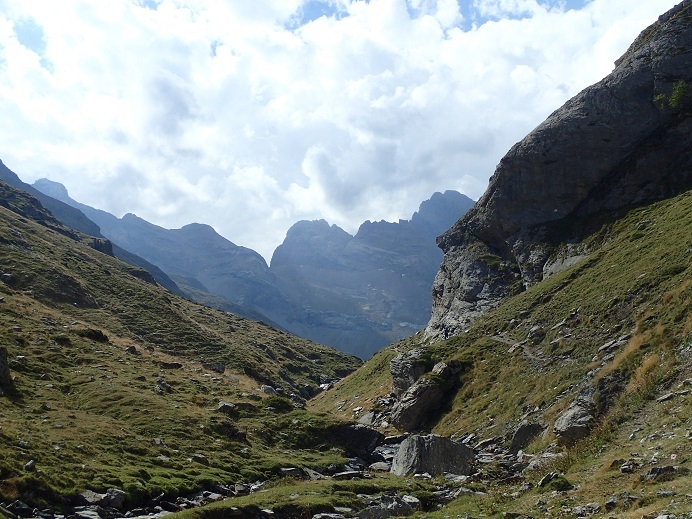 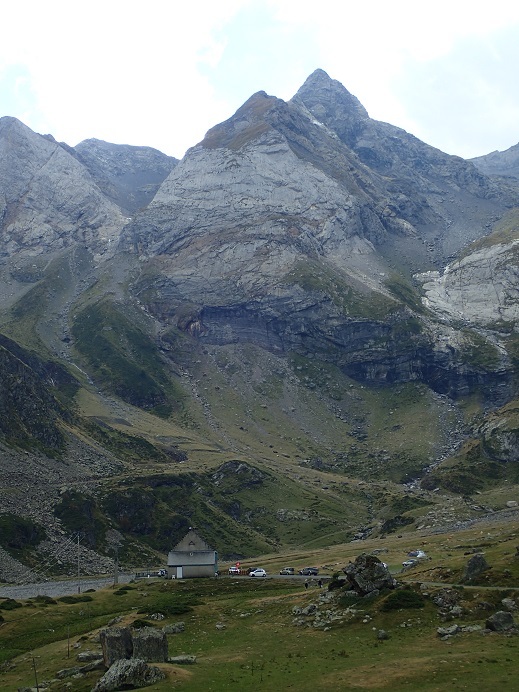 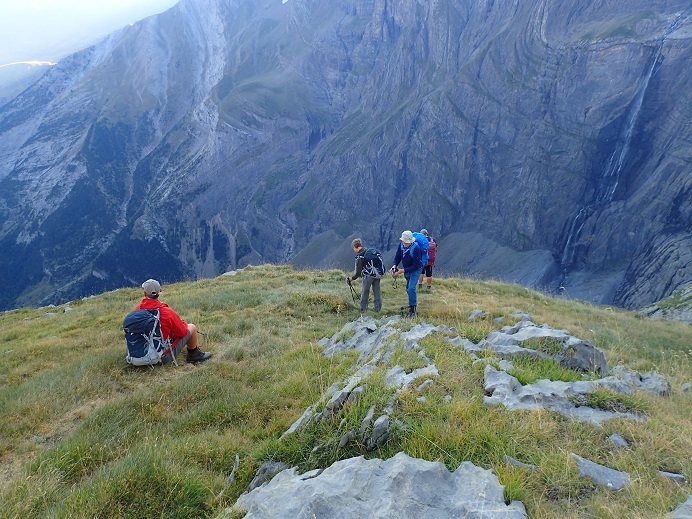 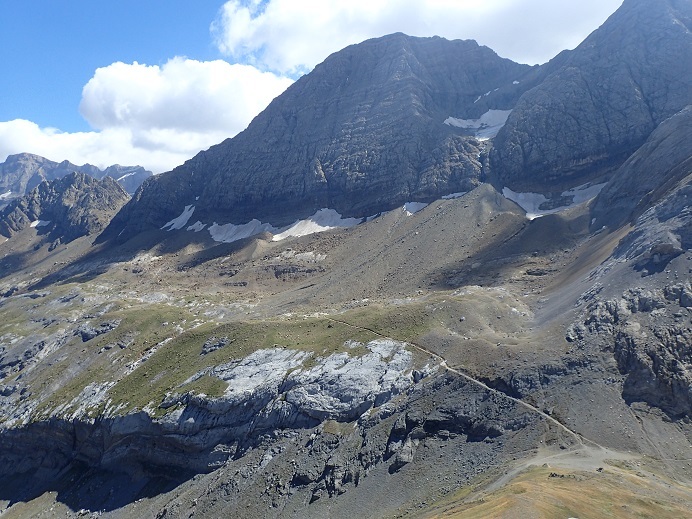 The rest of us had a straightforward, if long, traverse around two valleys to get to the CAF hut above Gavarnie. 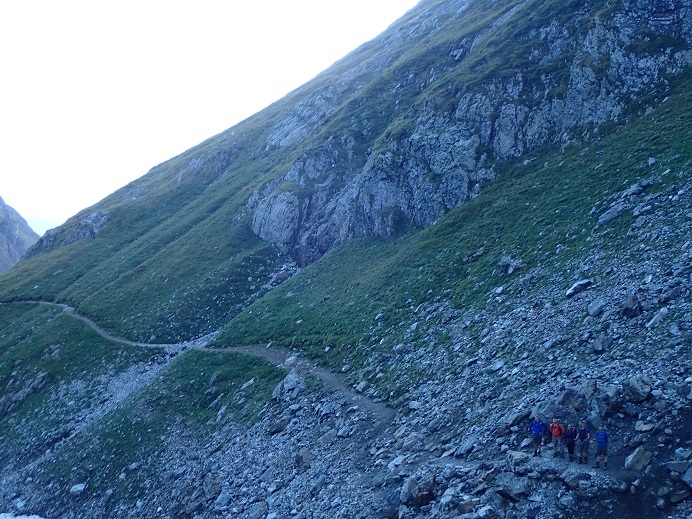 Again the group was spread out on the mountainsides with a gap between us. 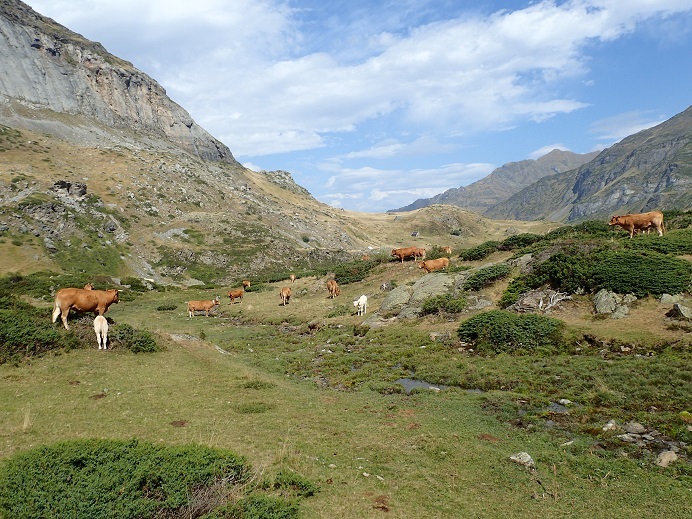 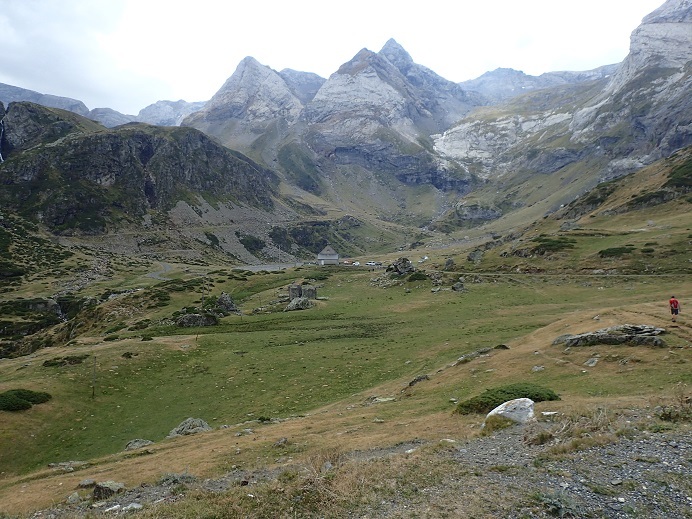 The well marked path passes through several deserted high mountain farmsteads before an easy descent into Gavarnie. 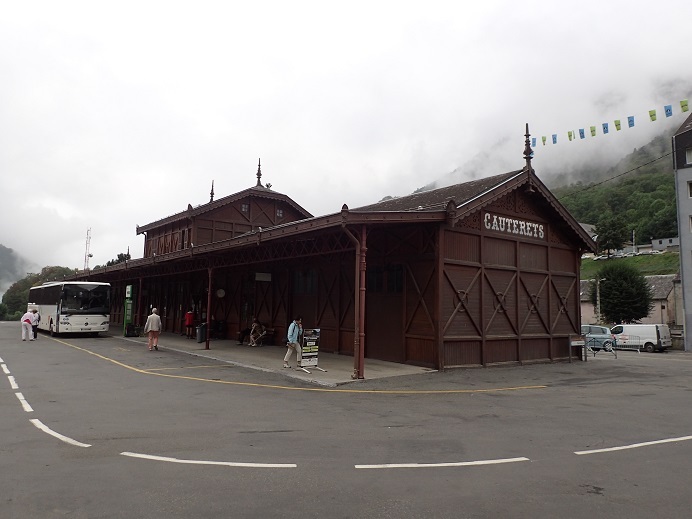 Being late in the season Gavarnie was almost closed for the winter with only a handful of shops open. 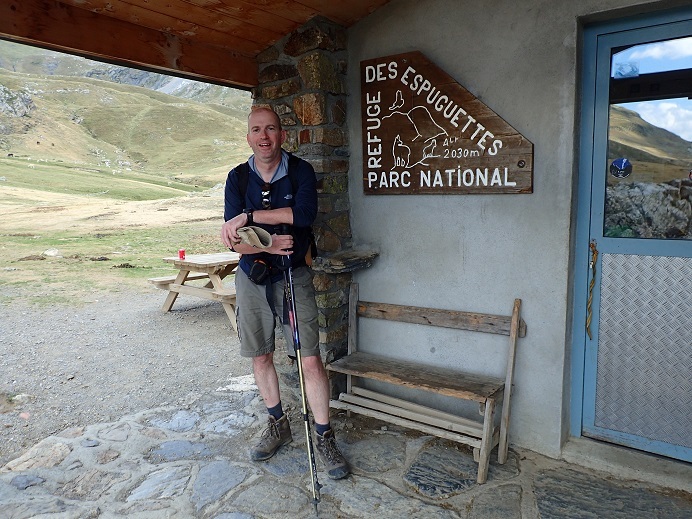 We sat in the hut & passed the time either by having a snooze, or seeing what the wine was like. 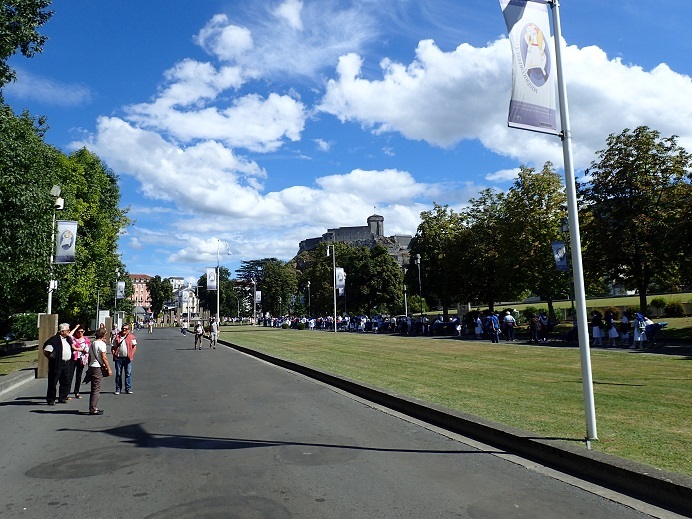 Our taxis were awaiting us bright and early (well one was) so half the party piled into the back & set off for Lourdes. 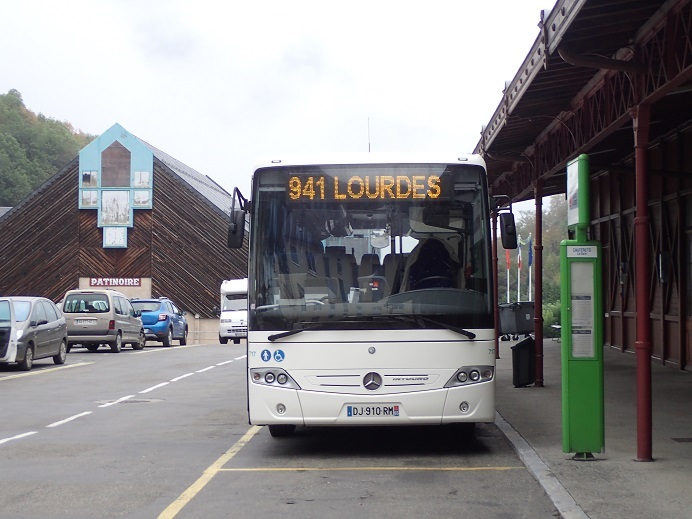 We passed the other cab after a few minutes & after an hour or so we were back in Lourdes. 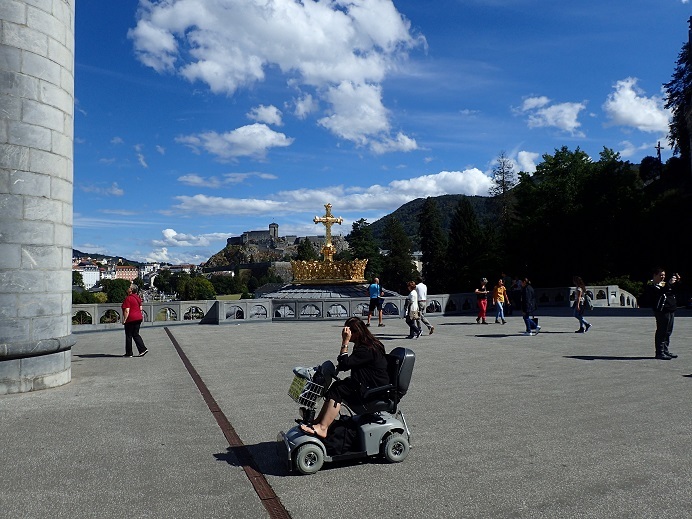 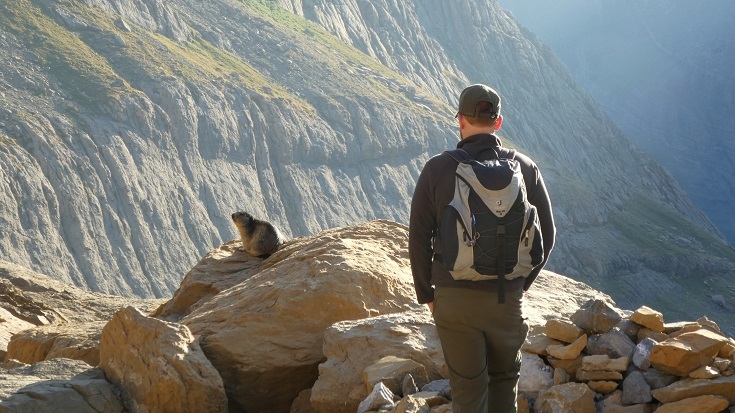 Our flight was an afternoon one so we had a few hours to kill – heightened security at the Grotto & Basilica meant we couldn’t take our rucksacks in without a thorough search, so we went to have an early lunch & beer or two….